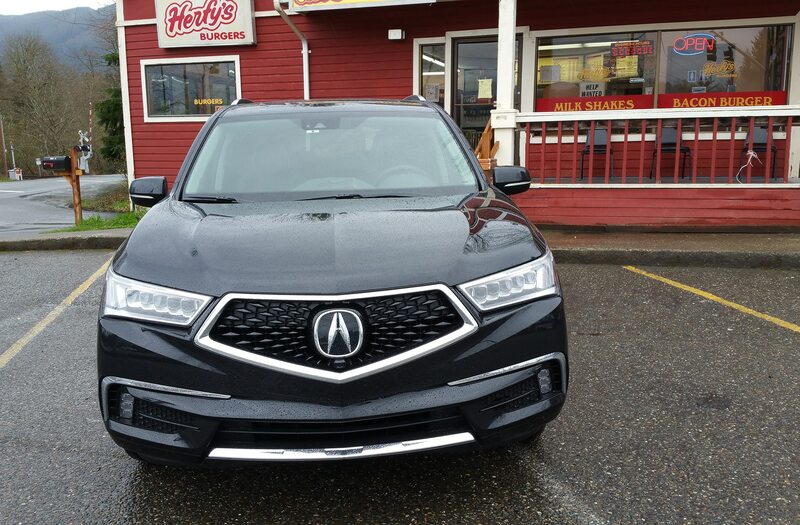 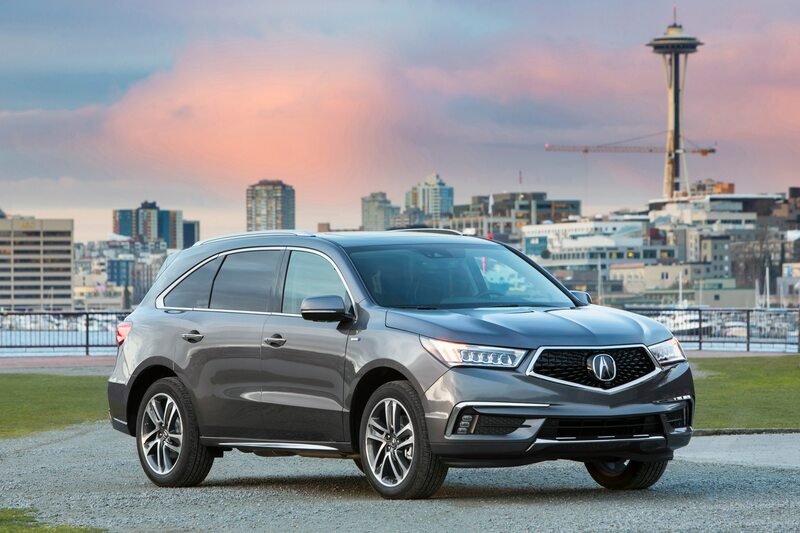 SEATTLE, Washington — The wet, winding roads of the Pacific Northwest are no match for the all-new 2017 Acura MDX Sport Hybrid SH-AWD. 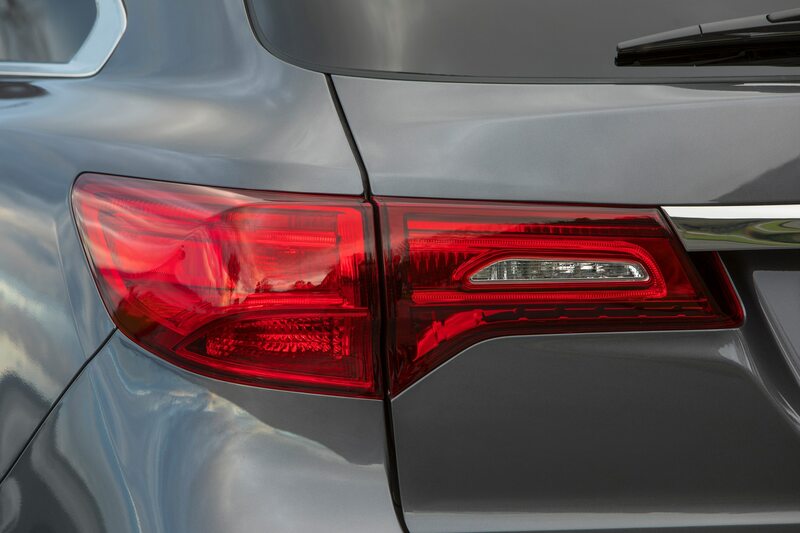 Apparently for the folks at Honda’s upscale brand, neither are mouthful names. 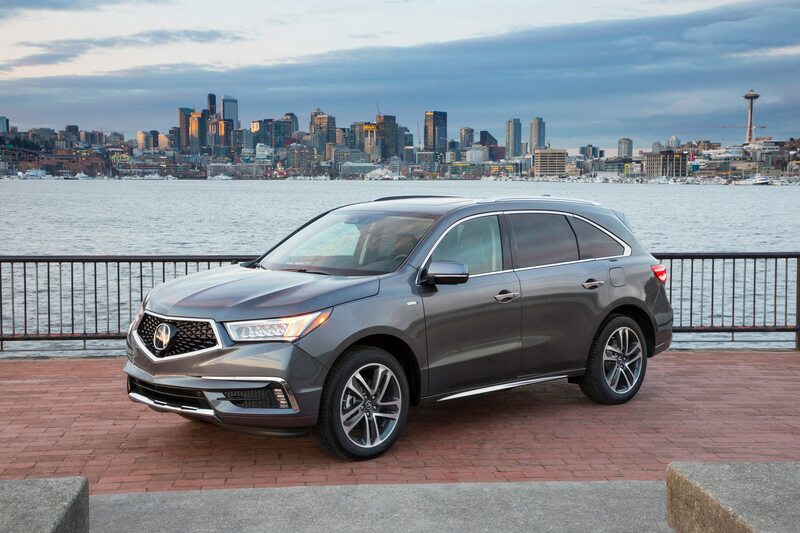 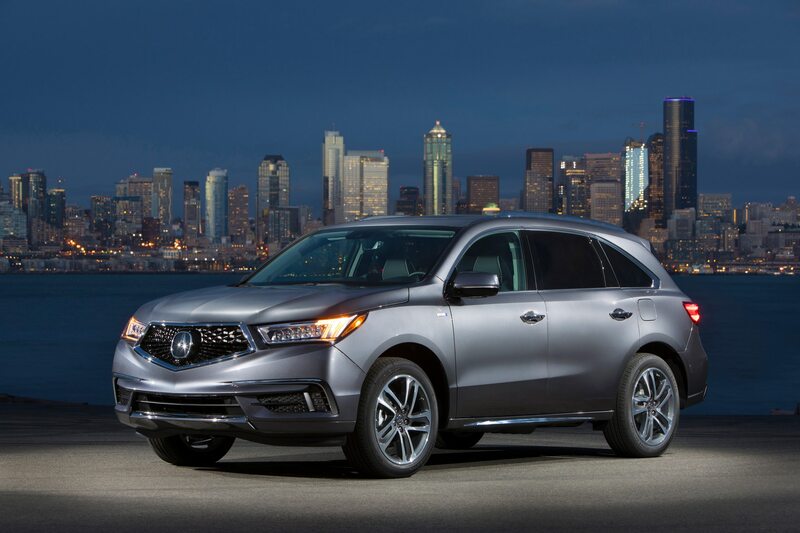 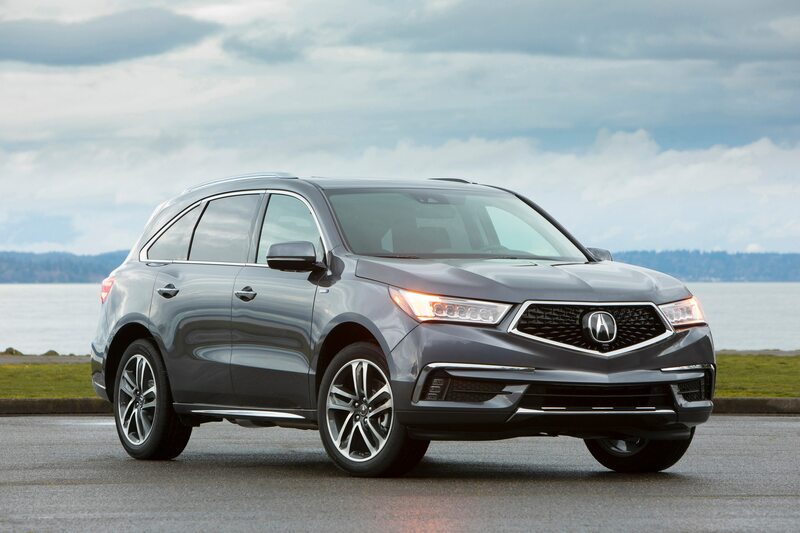 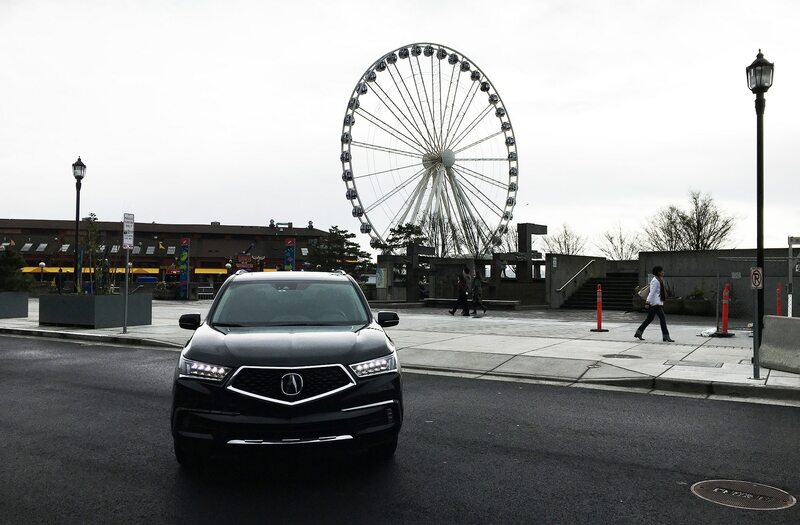 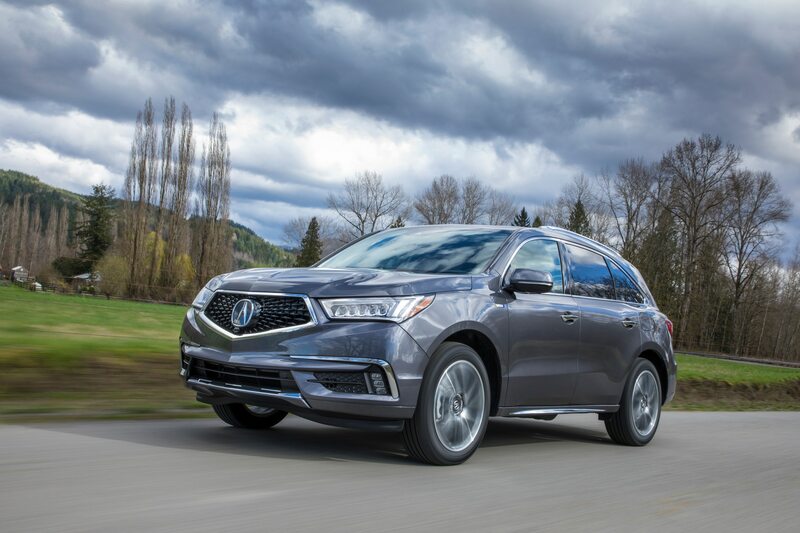 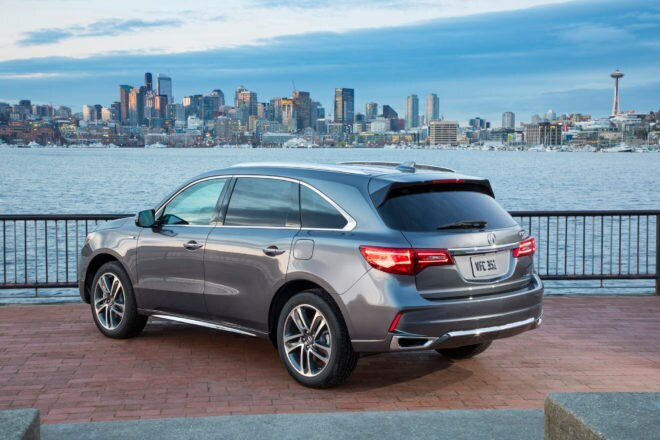 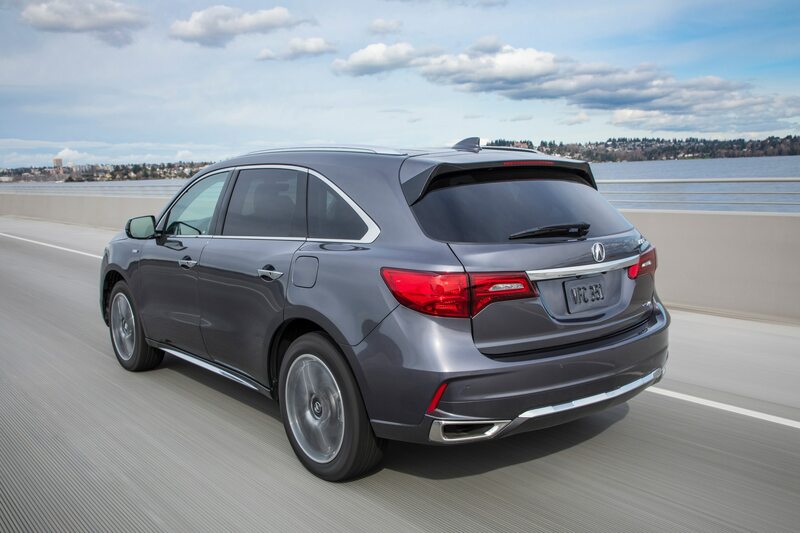 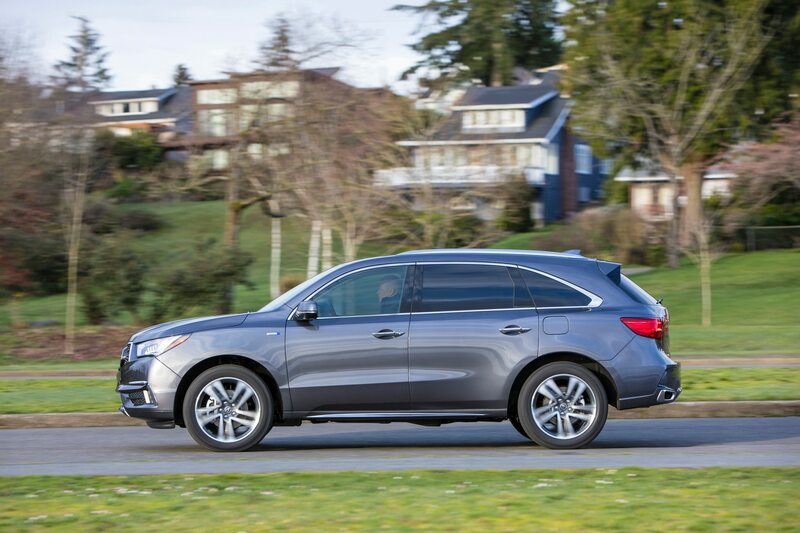 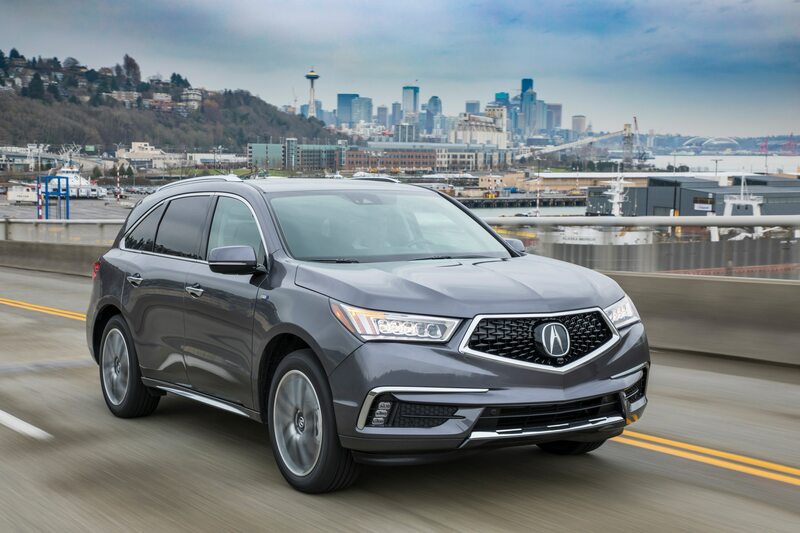 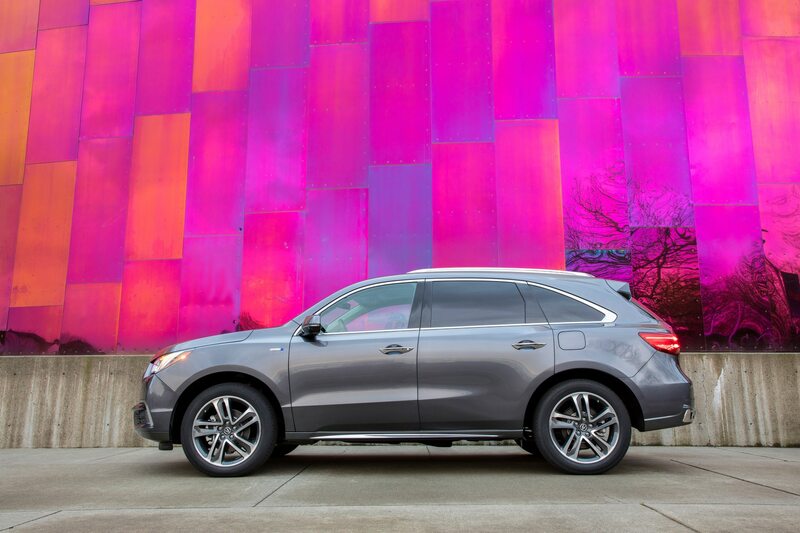 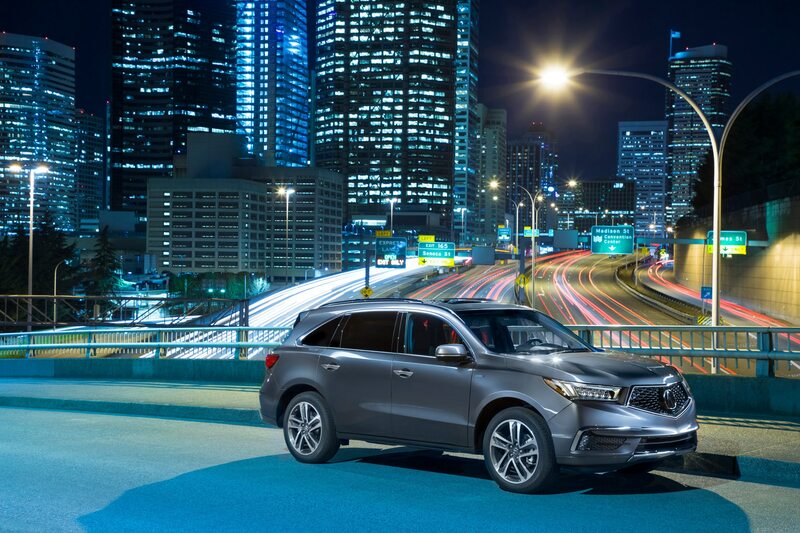 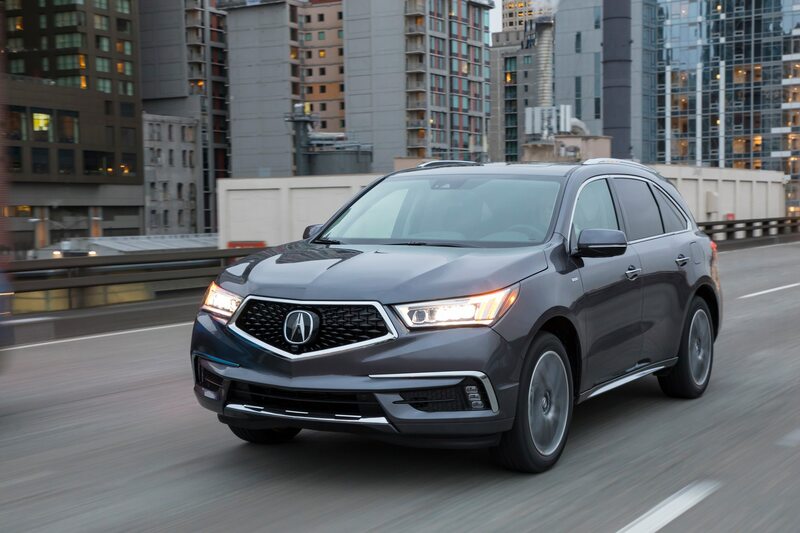 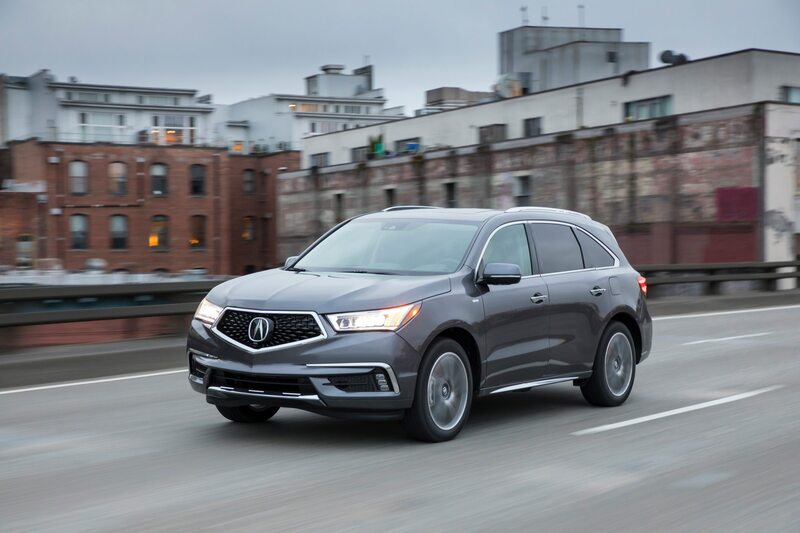 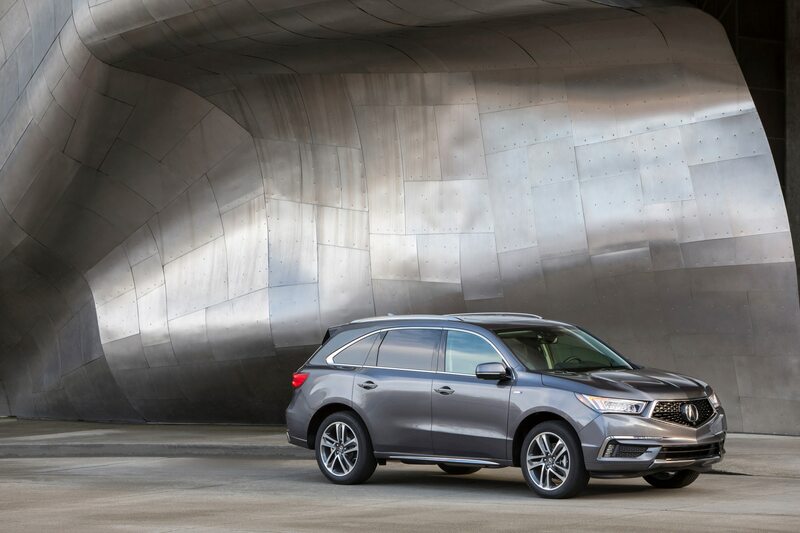 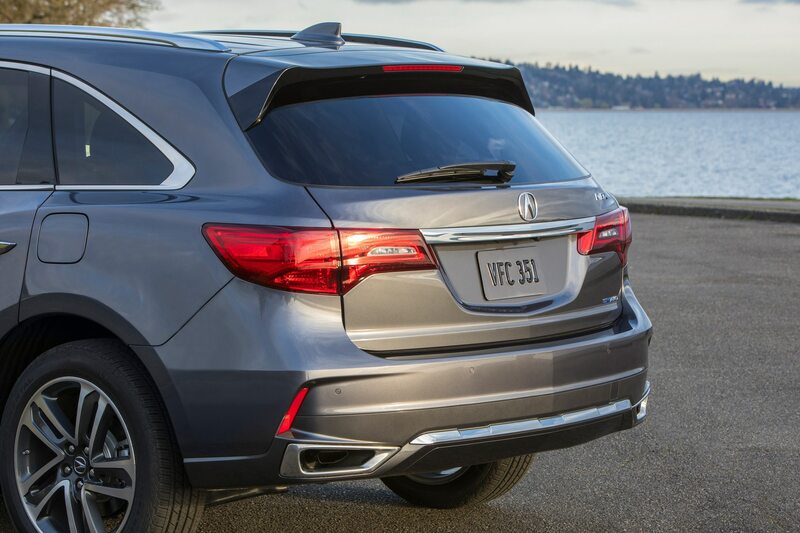 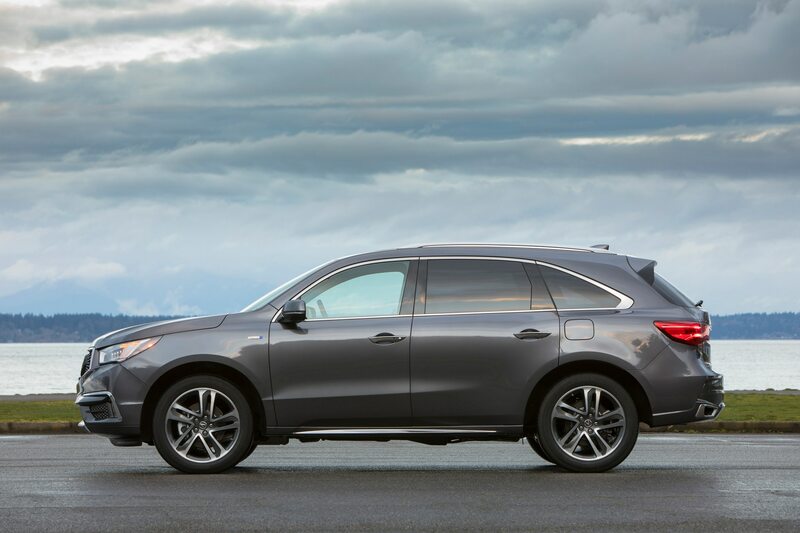 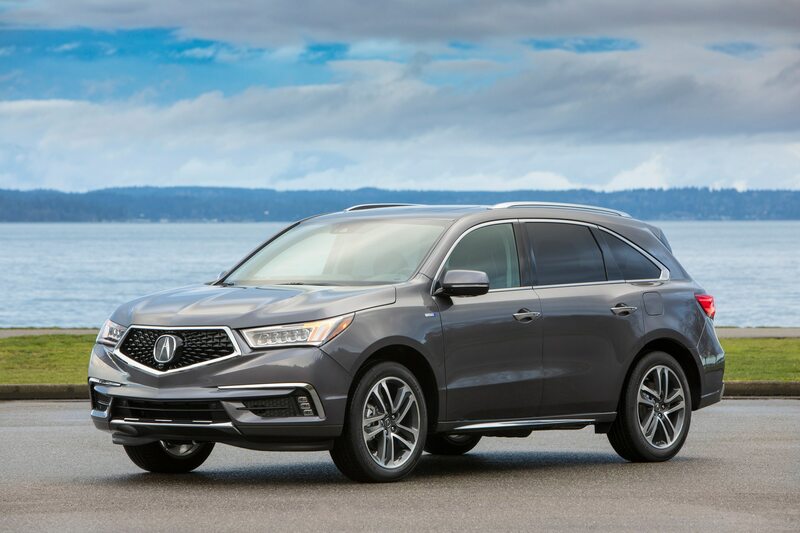 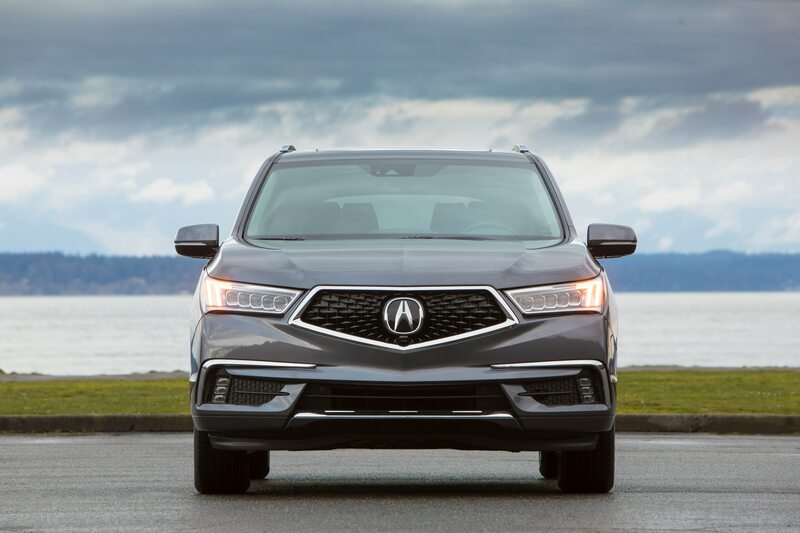 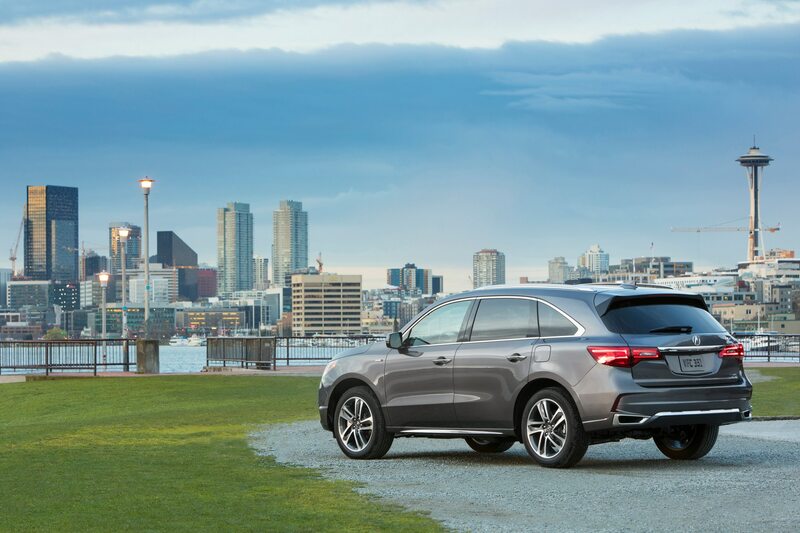 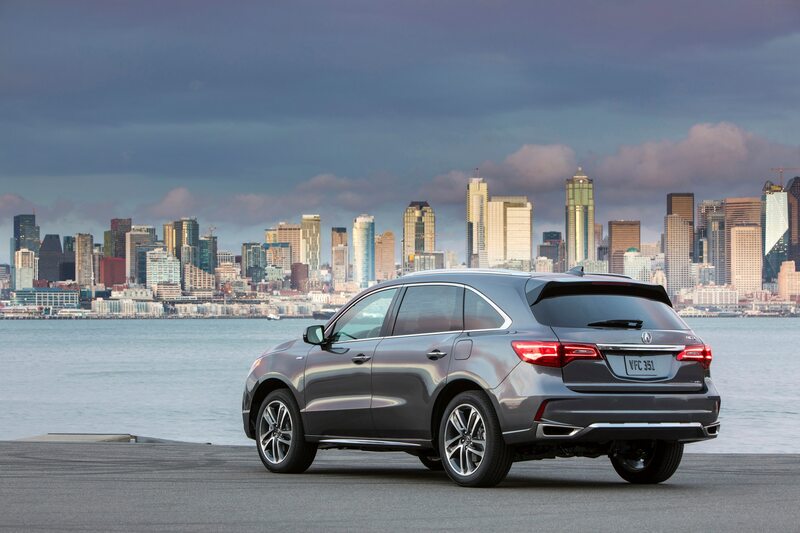 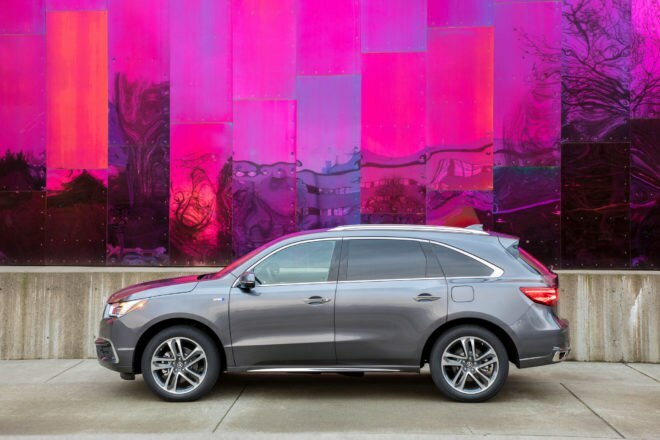 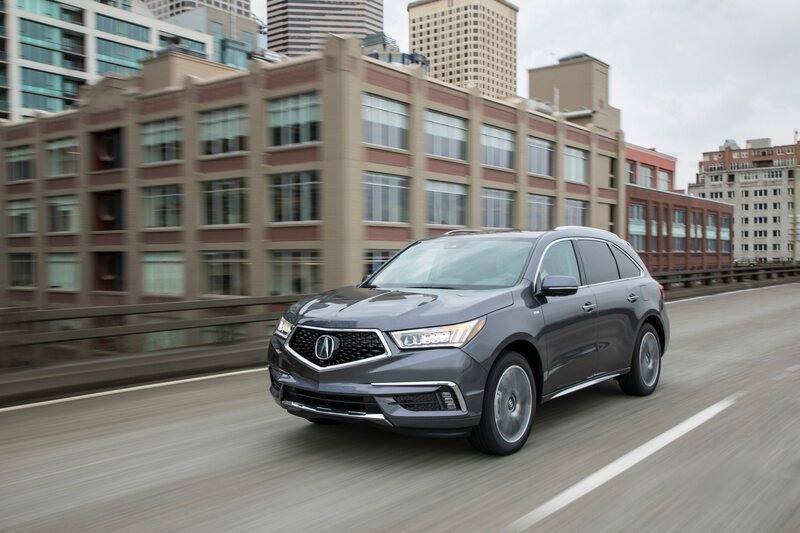 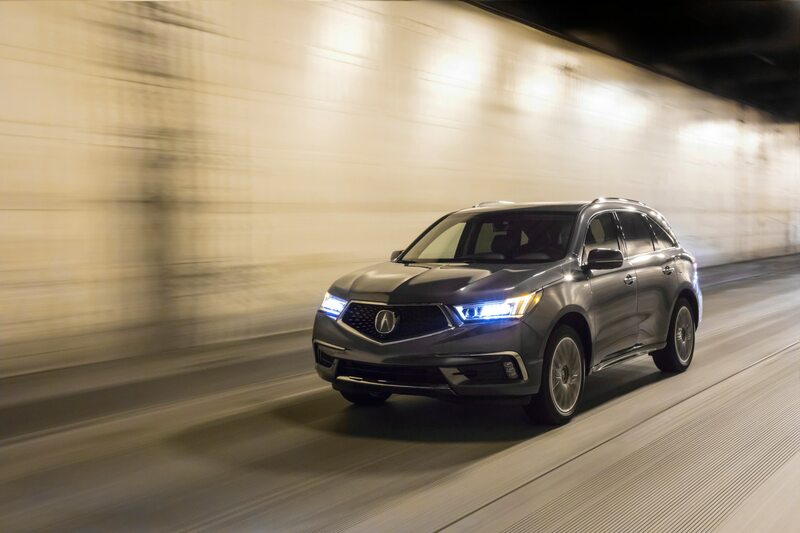 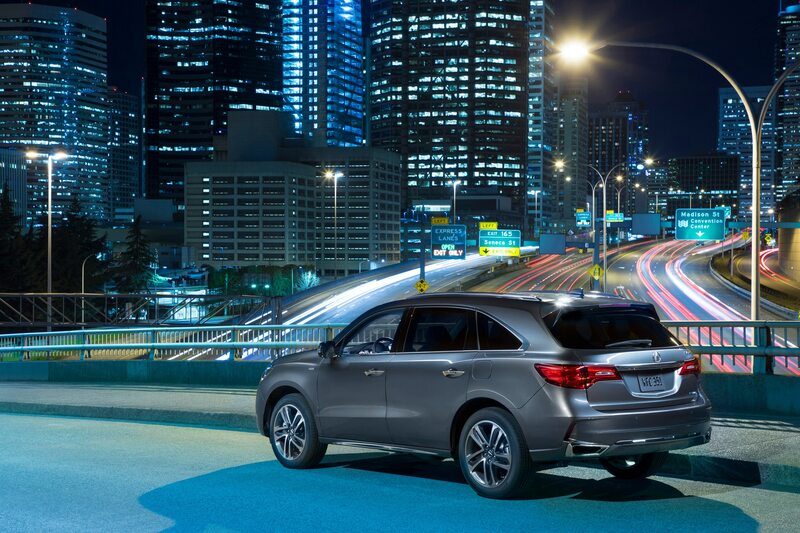 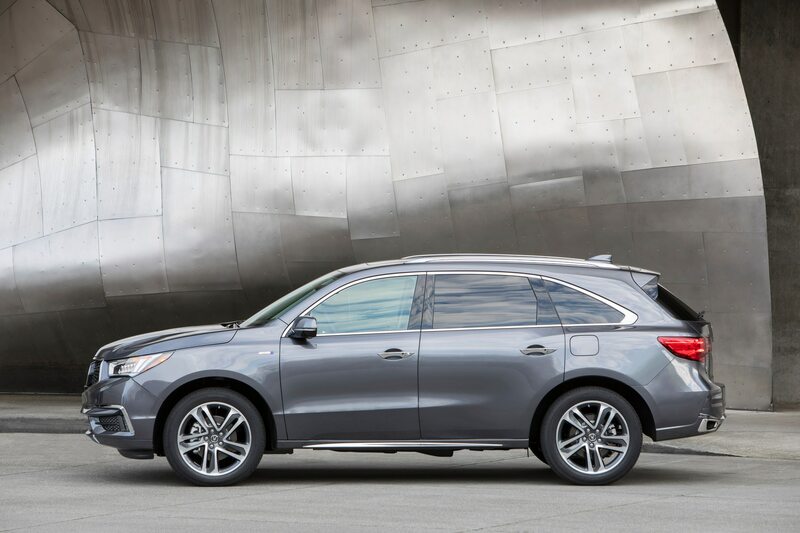 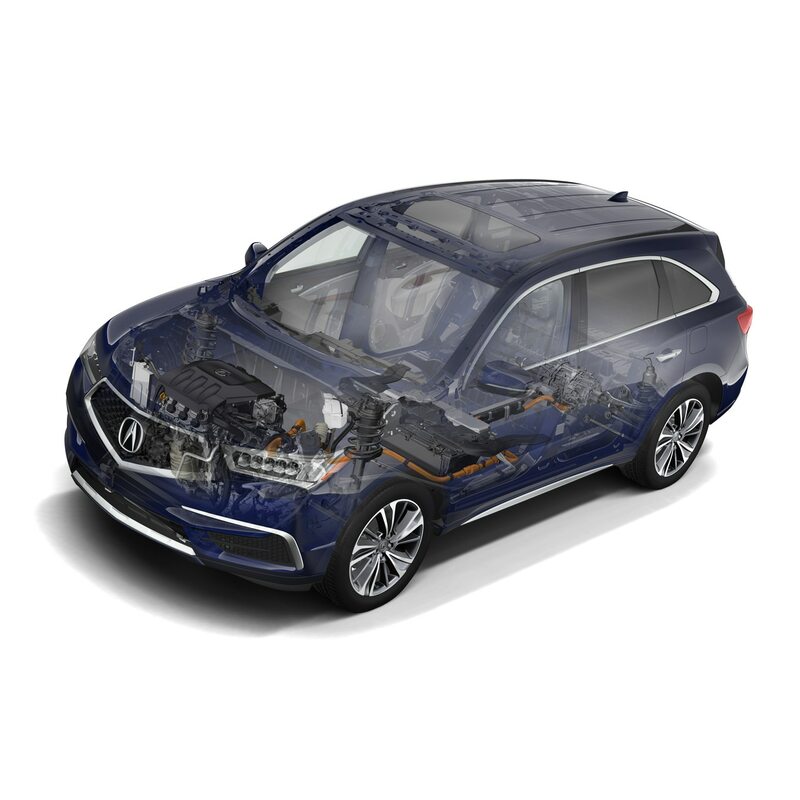 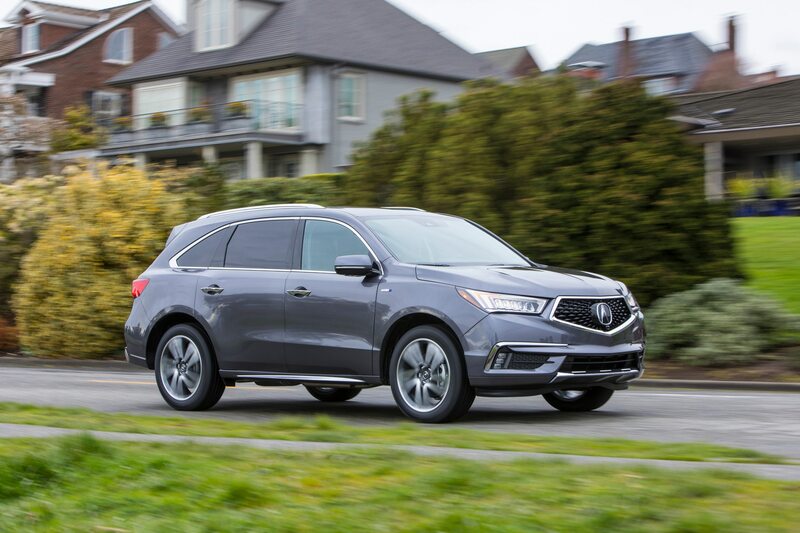 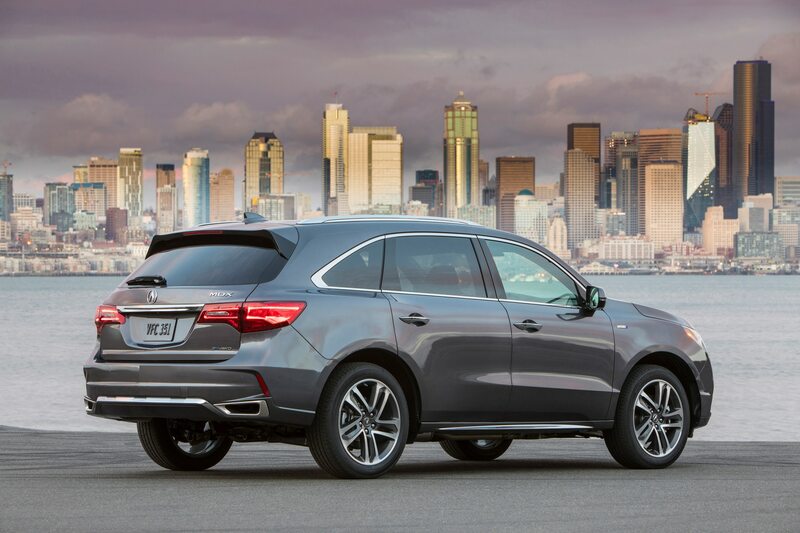 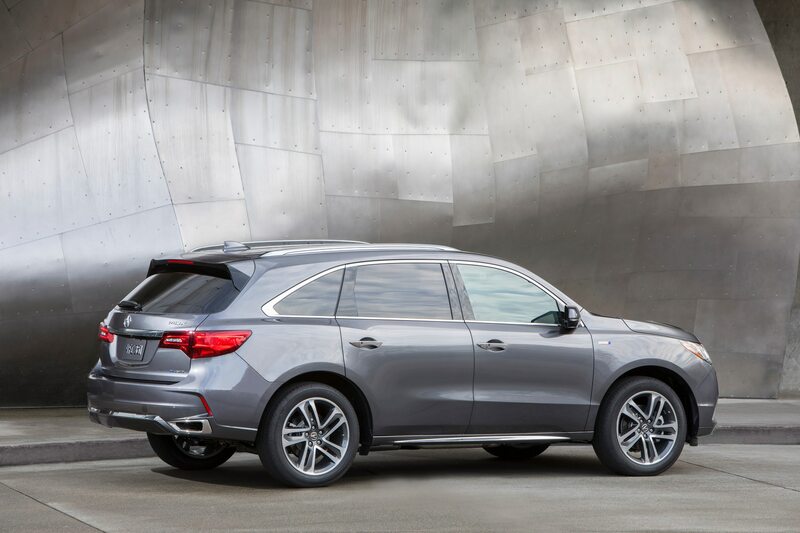 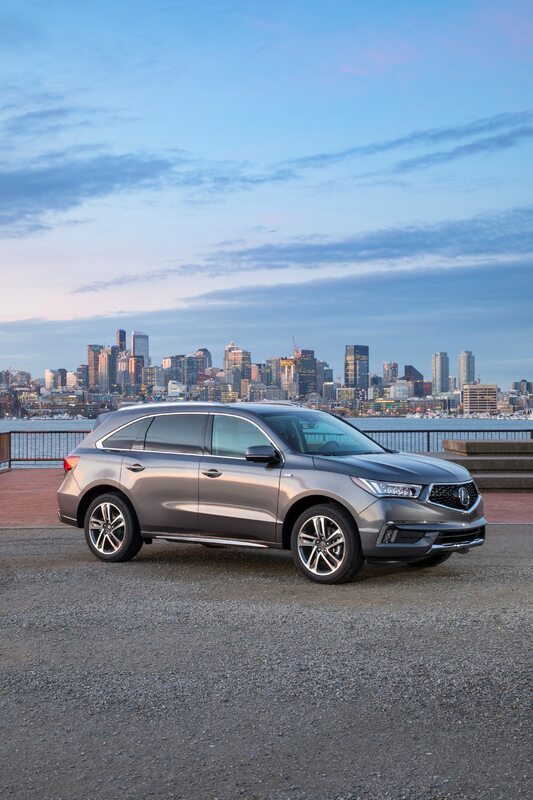 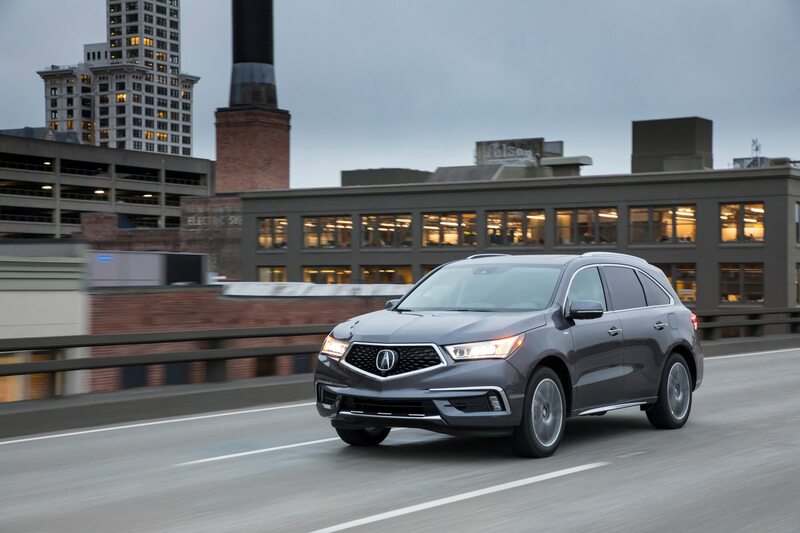 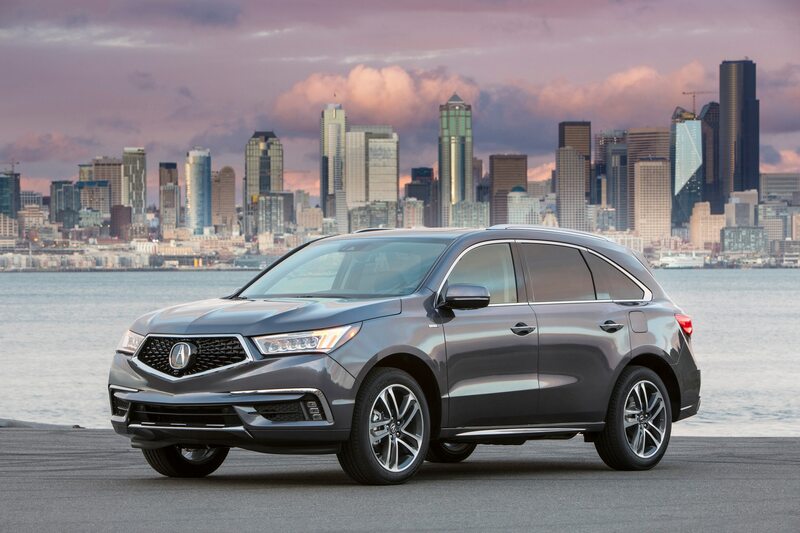 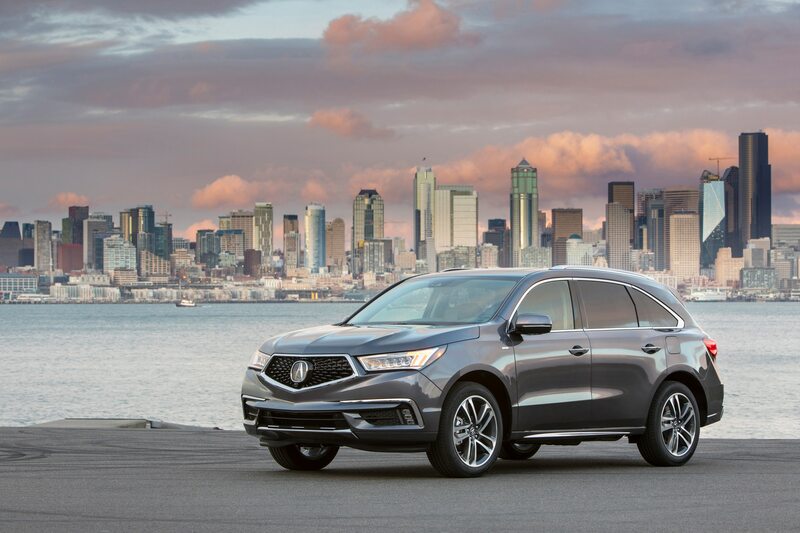 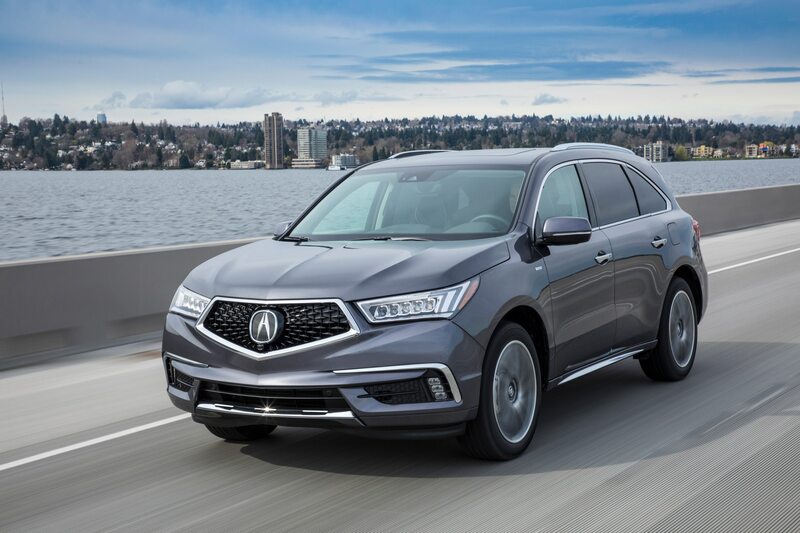 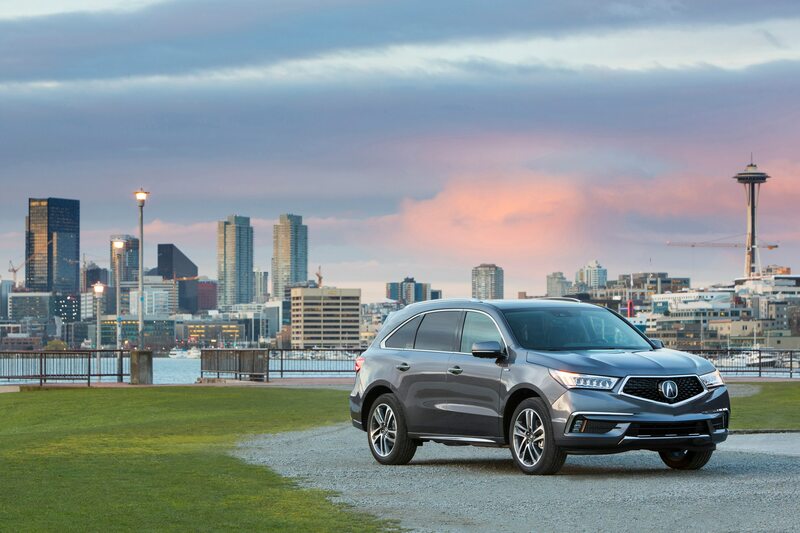 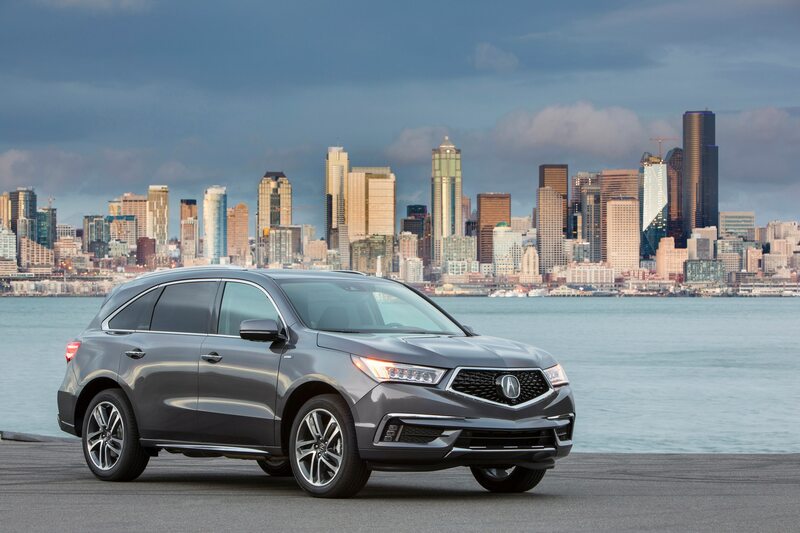 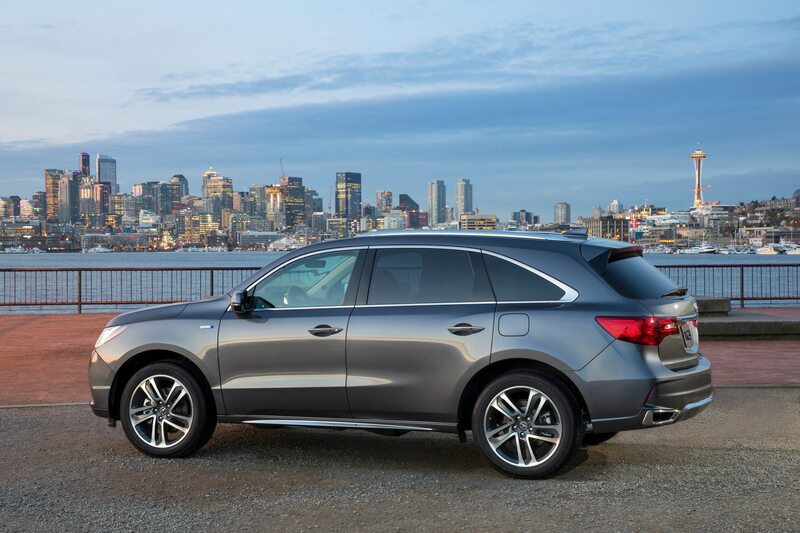 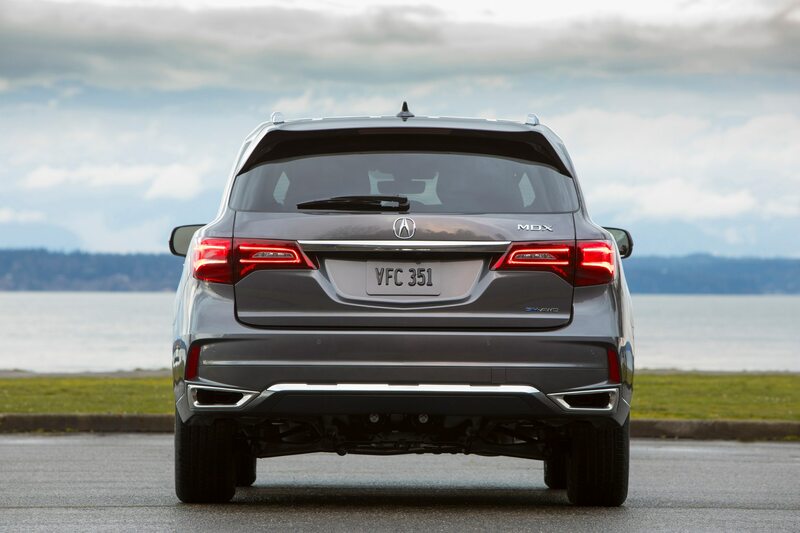 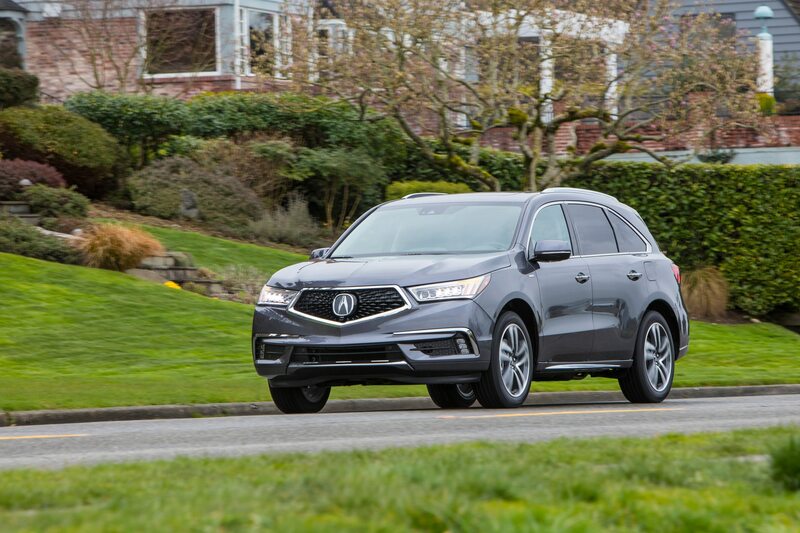 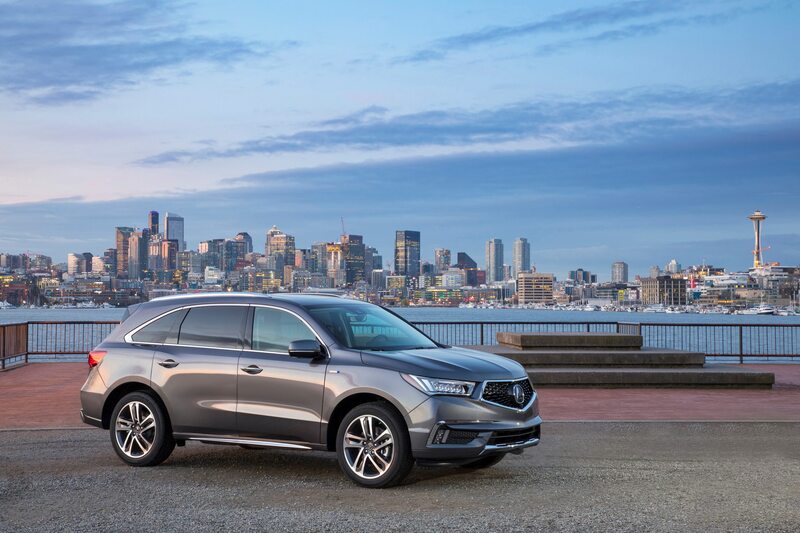 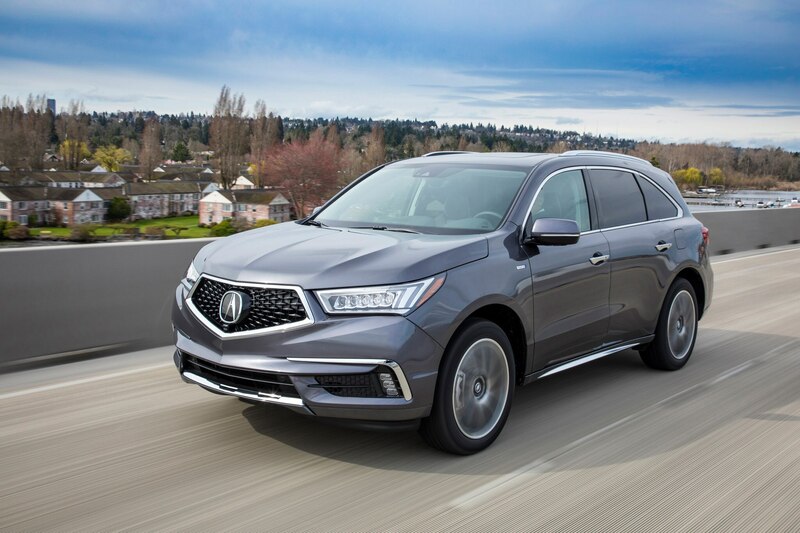 The hybrid MDX offers more power and better handling thanks to its Sport Hybrid SH-AWD powertrain technology, which helps inspire more confidence behind the wheel — especially in the rain, which Seattle is famous for getting plenty of. 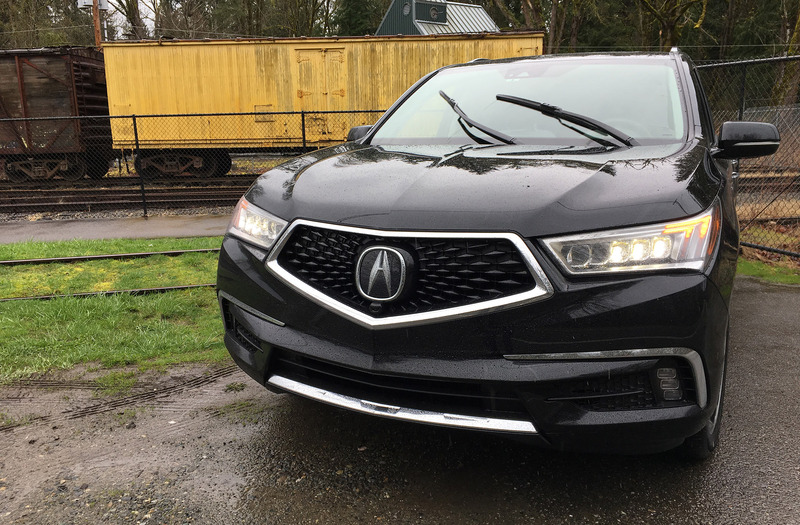 The AWD helped us stay glued to the asphalt as we splashed through a partially flooded country road with barely a wiggle. 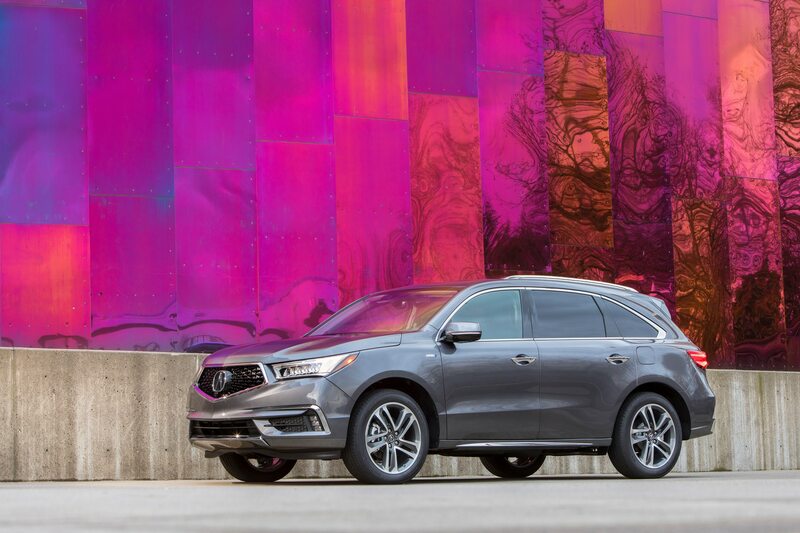 It’s the top three-row SUV among under 35-years olds says Acura. 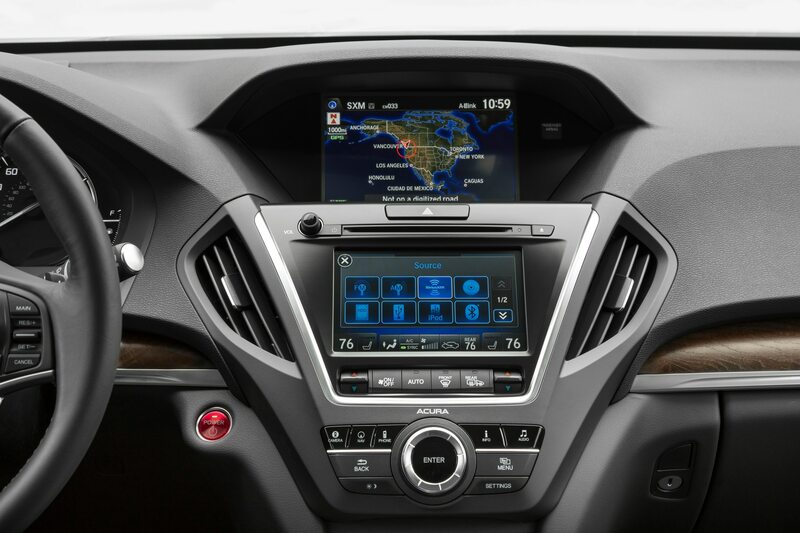 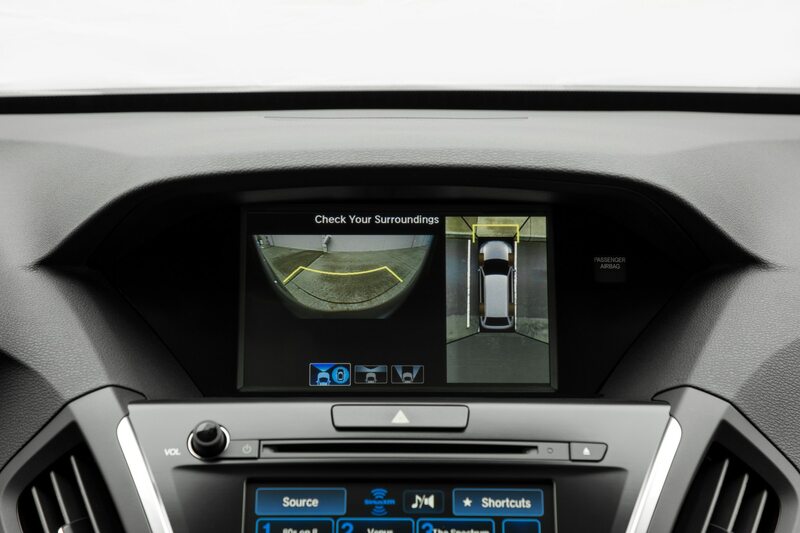 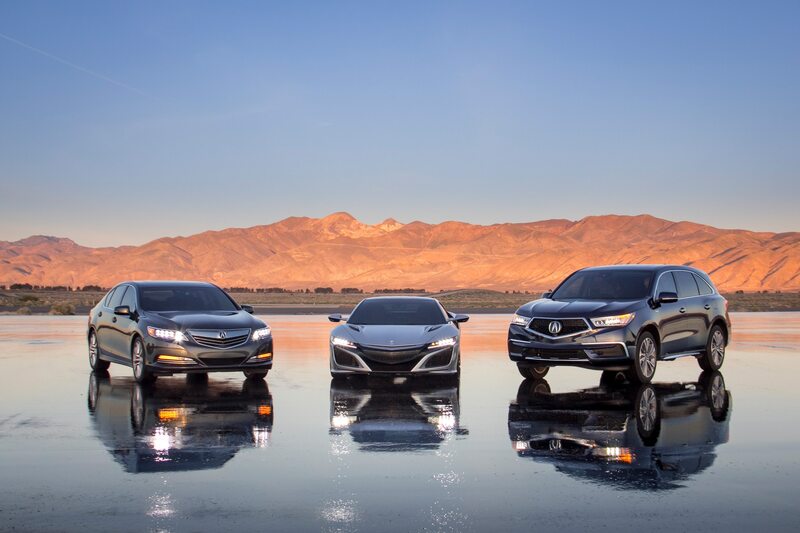 Its updated tech was previously introduced in the RLX sedan and NSX supercar, both of which we also get a chance to sample. 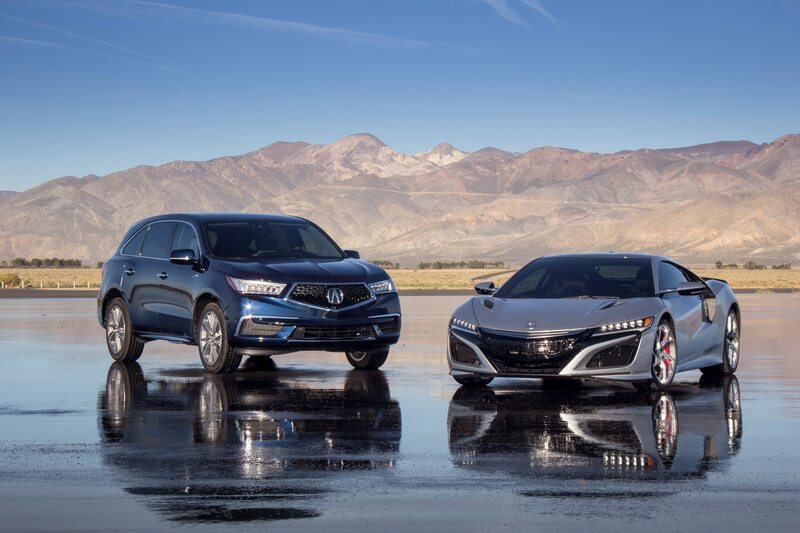 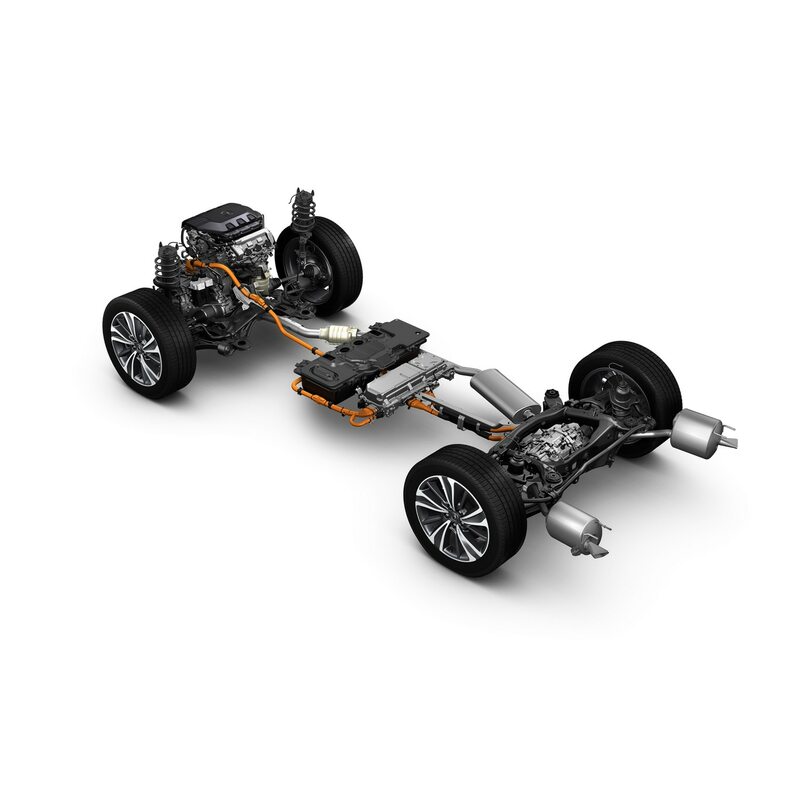 Comparisons to the NSX are sprinkled throughout the morning presentation and while Acura’s SUV and supercar are miles apart in many departments, they share quite a bit of hybrid chicanery. 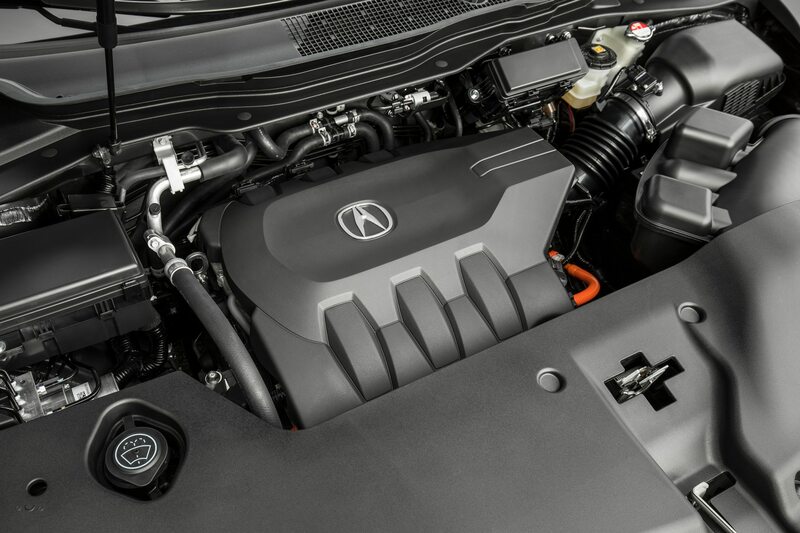 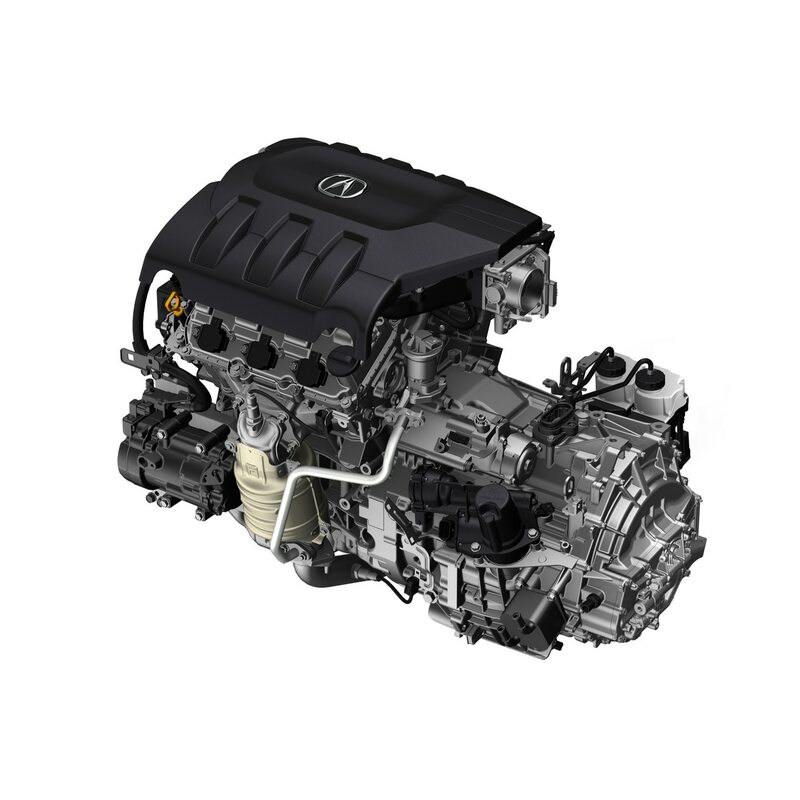 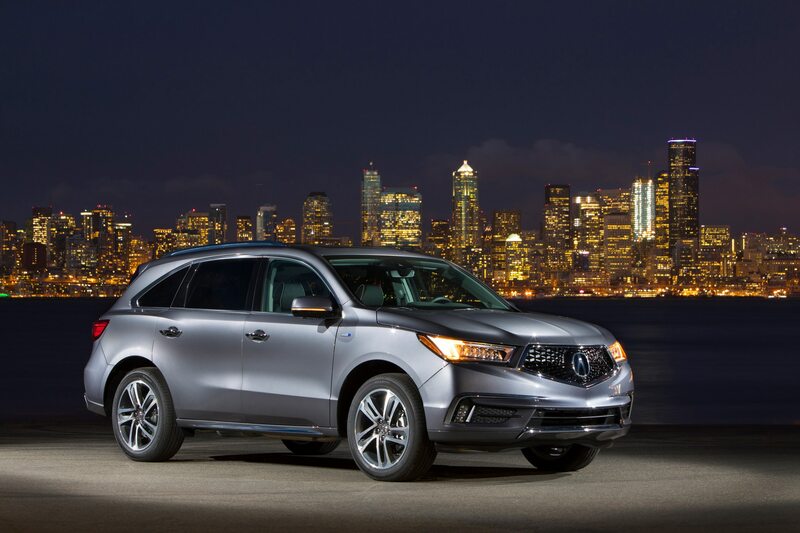 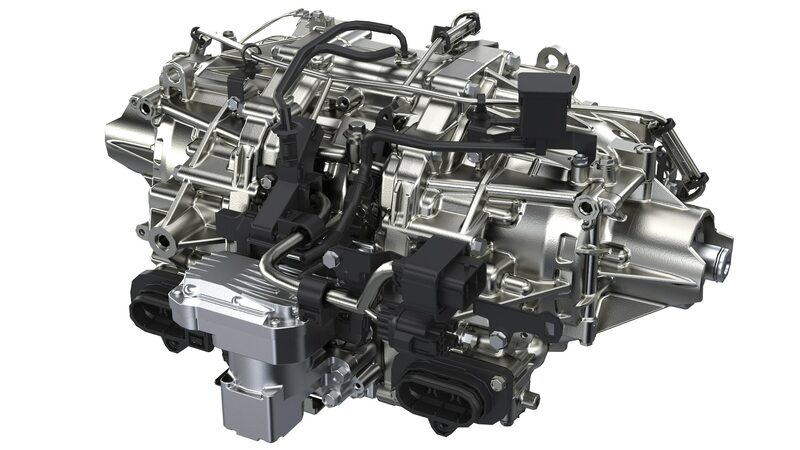 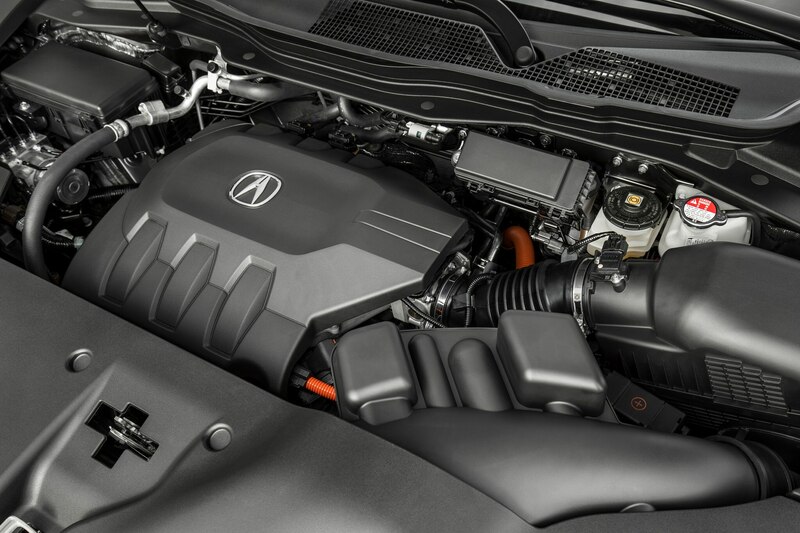 The hybrid MDX’s front-mounted V-6 engine is 3.0-liter unit that offers 257 hp and 218 lb-ft of torque. 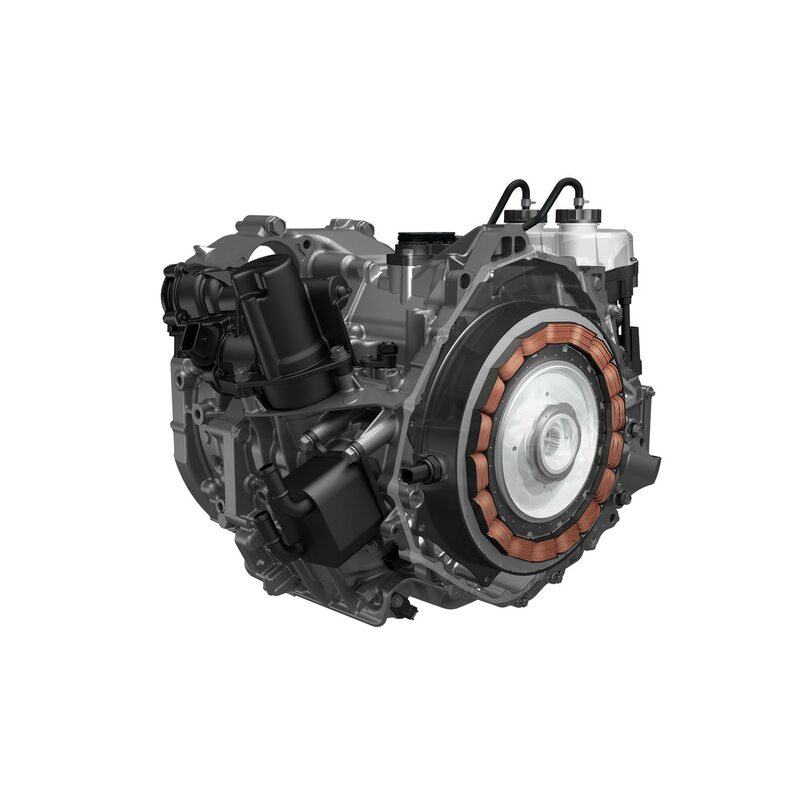 Its mated to a smooth seven-speed dual-clutch transmission, which includes the front motor. 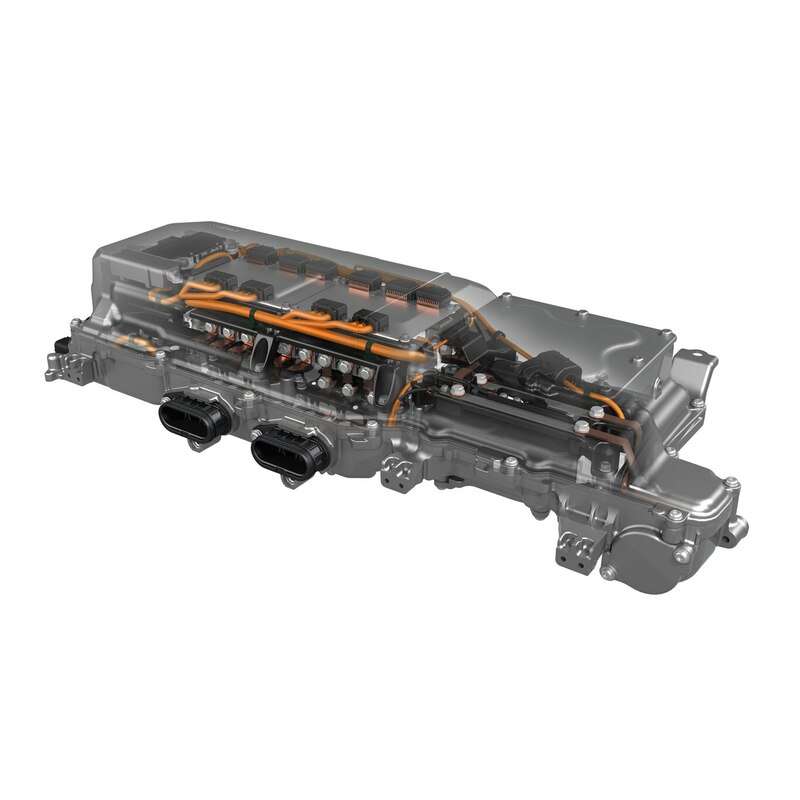 That motor provides 47 hp while the rear Twin Motor Unit (TMU) adds makes 72 hp for a combined system output of a healthy 321 hp and 289 lb-ft of torque. 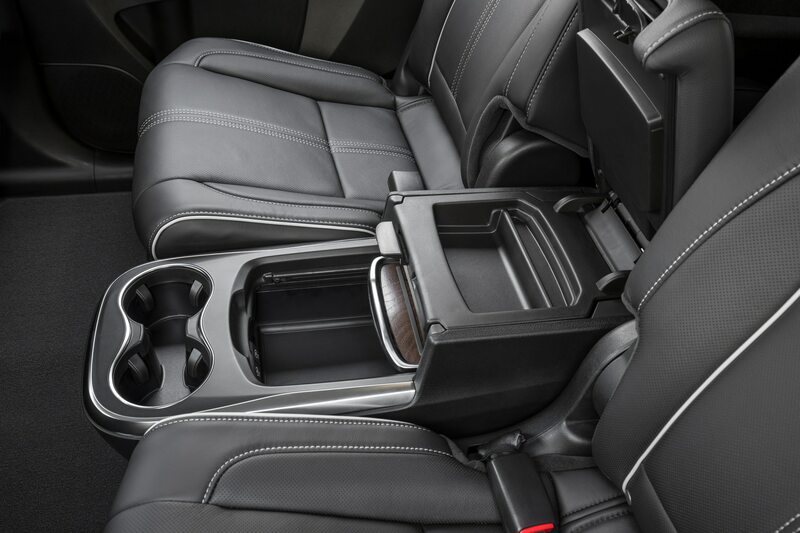 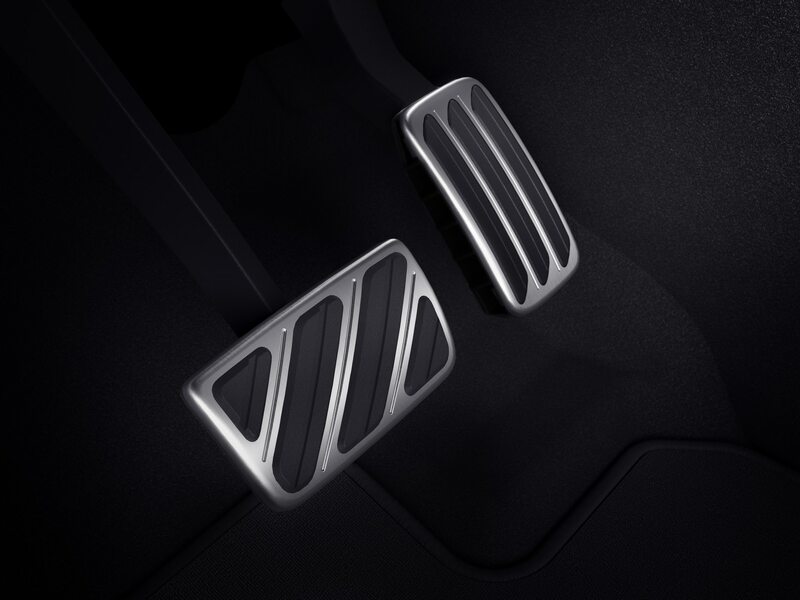 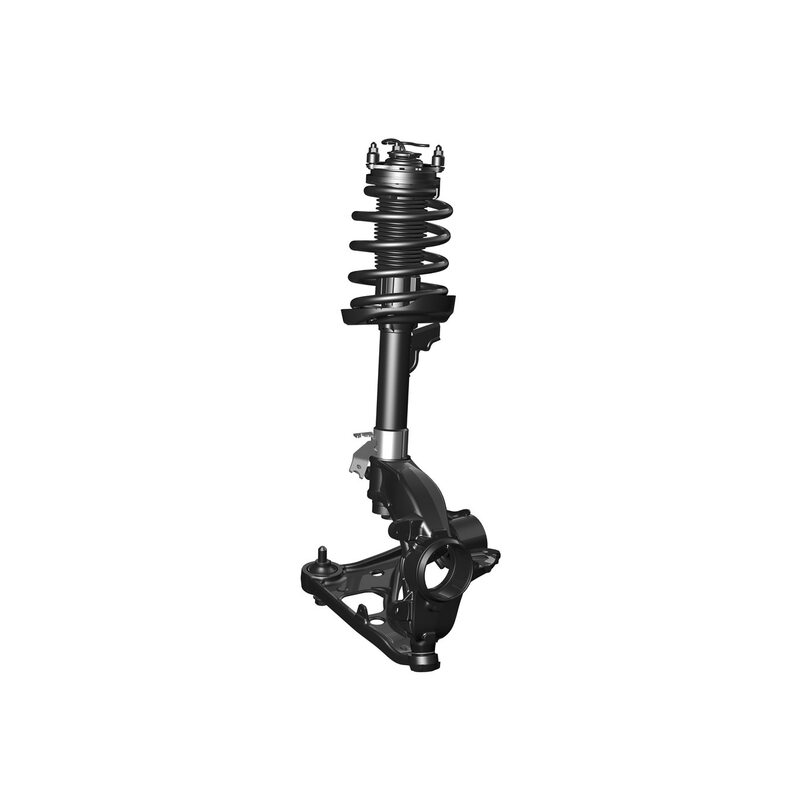 The compact, high-output motors provide instant, precise torque sent exactly to the wheels that need it as you tap your foot on the SUV’s stainless steel sport pedal. 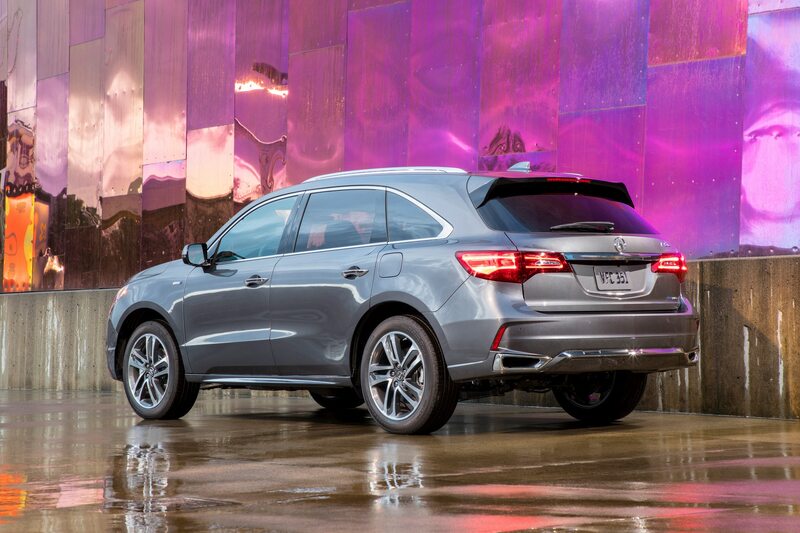 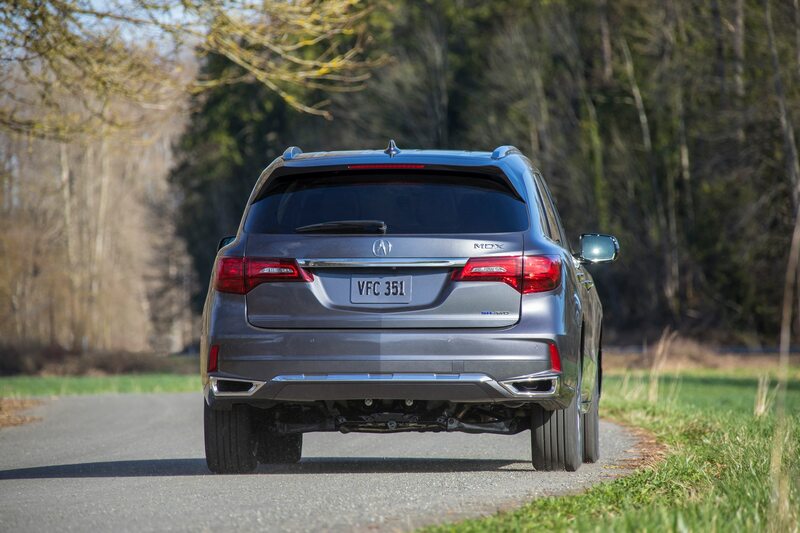 Thanks to that setup, the MDX hybrid can hit 60 mph in an estimated 6.1 seconds. 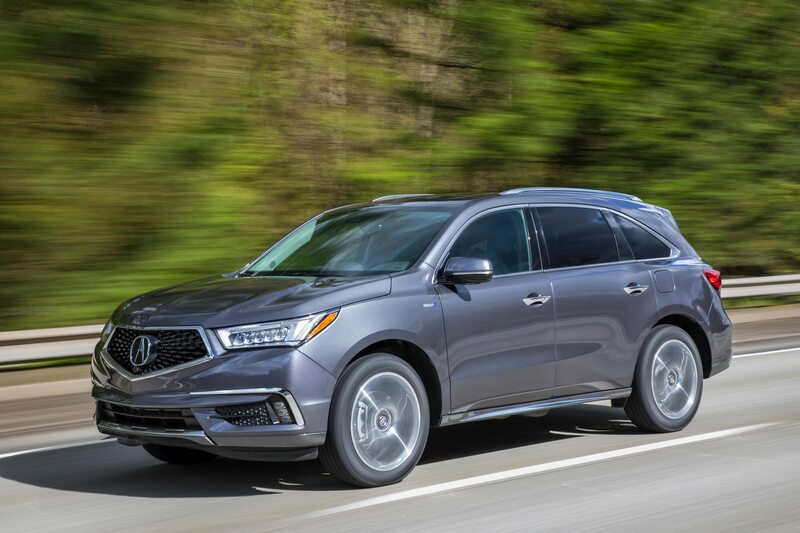 Not bad considering the SUV weighs in at healthy 4,471 pounds, which you don’t necessarily feel thanks to the extra power and torque. 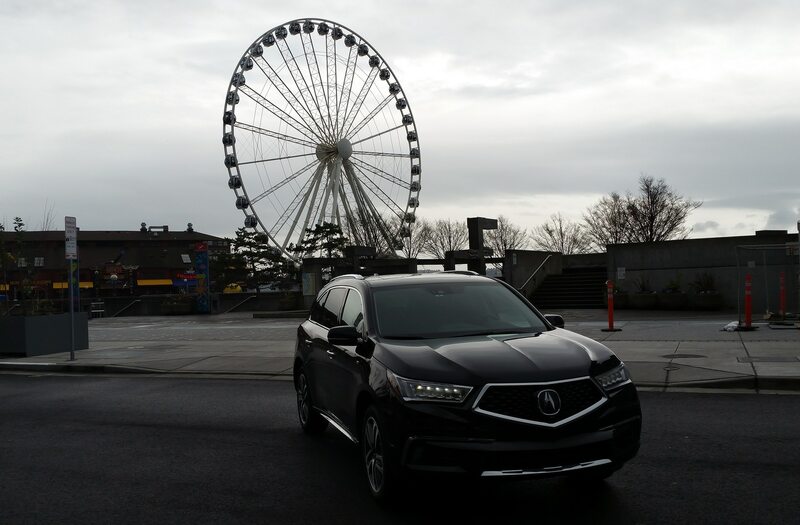 Tackling the hilly streets of Seattle, where we kept the SUV mostly in its comfort and normal modes (there are four driving mode in all; the other two sport, and sport+) was a breeze. 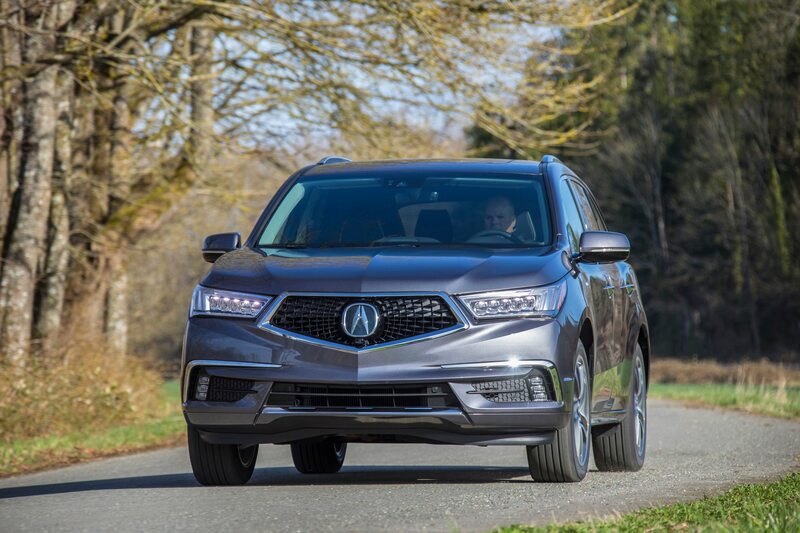 Power delivery is immediate and the steering felt relaxed, tighting up a bit when switching to sport mode for the associated more responsive ride. 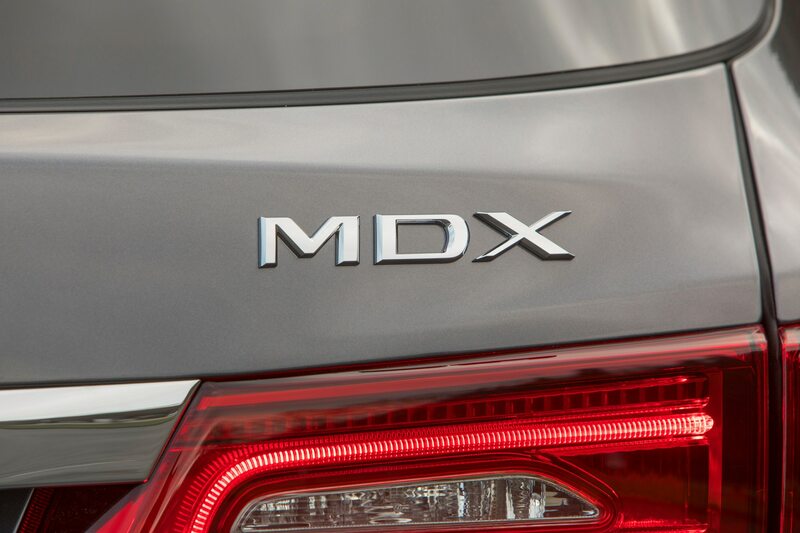 The rainy weather kept us from pushing MDX, but we didn’t lose any traction during the day’s mostly sedate ride. 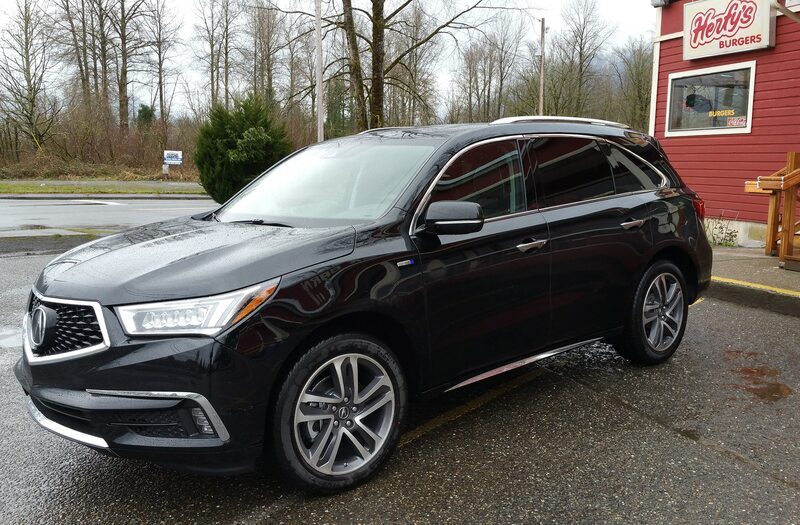 The hybrid version seems like an easy choice for small families that will be mostly shuttling the kids, dog, and groceries around town. 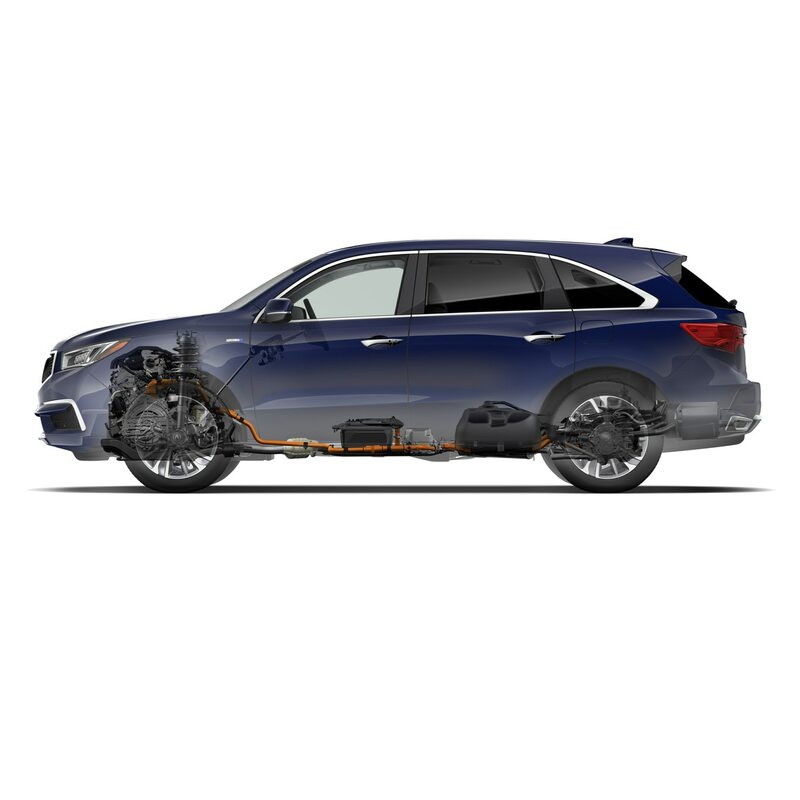 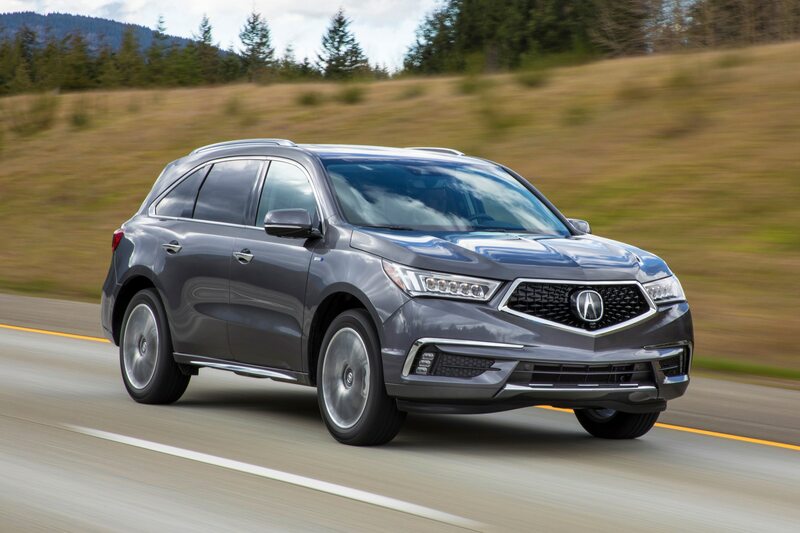 It’s not a bad deal, unless you want to use the SUV for towing, as Acura does not recommend using the hybrid for pulling work; in that case, you’re better off buying the gas-version, which can tow up to 5,000 pounds. 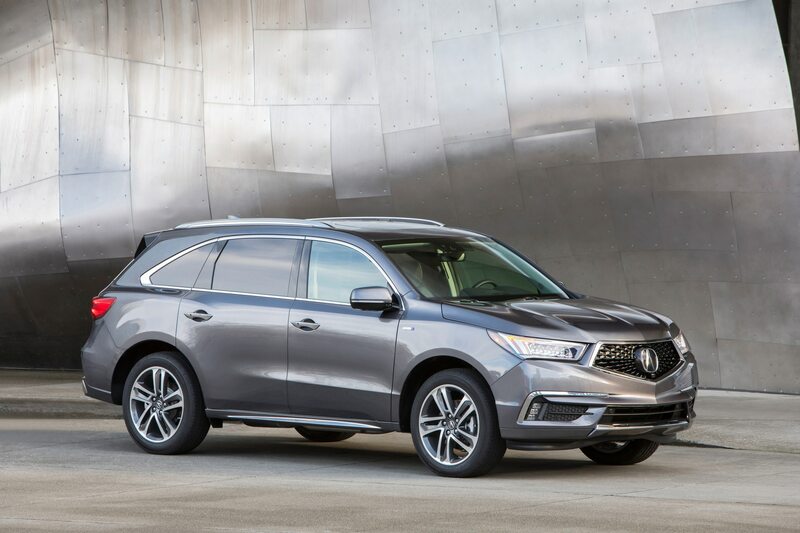 Acura says the third-generation MDX was designed with the hybrid variant in mind. 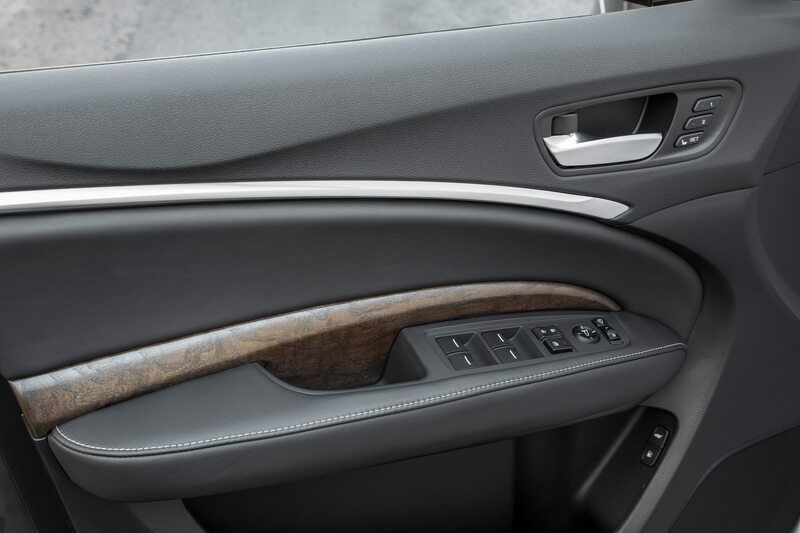 It offers the same interior cabin and ground clearance as its non-hybrid counterpart. 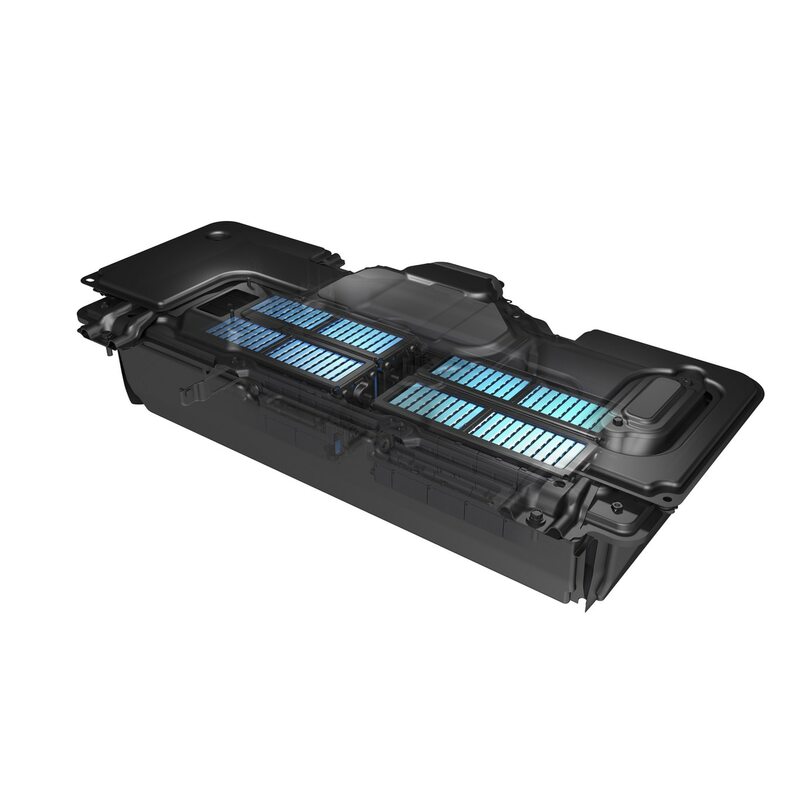 The hybrid system’s Intelligent Power Unit (IPU) resides underneath the driver’s seat, Power Control Unit (PCU) under the second row seats, and the TMU is located below the third set of seats. 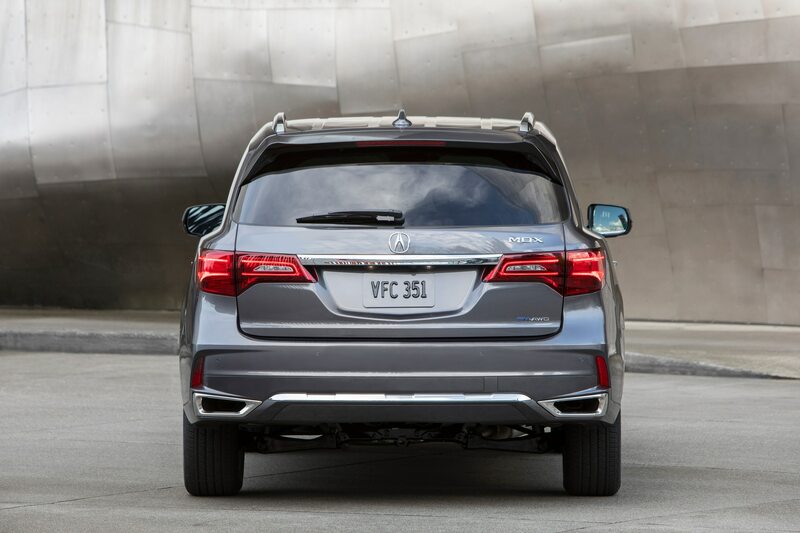 Aside from the badging, you can’t tell it apart from its sibling. 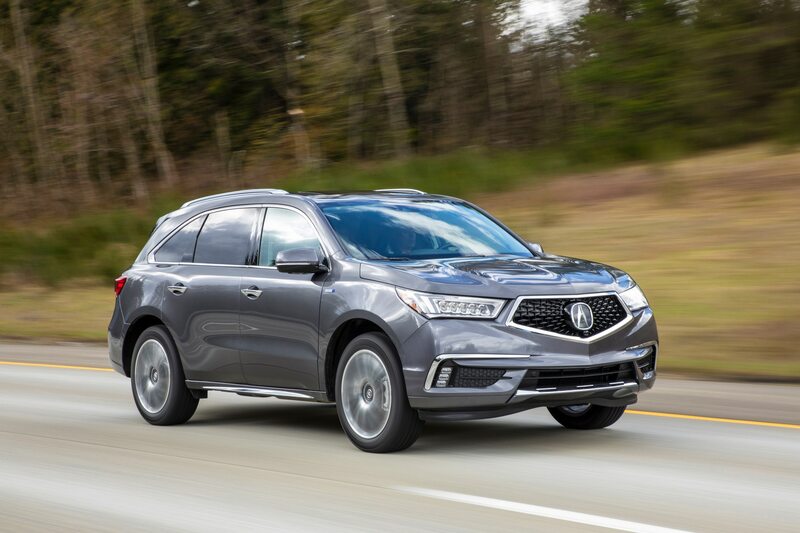 The extra weight is distributed evenly along the bottom of the SUV, providing the side benefit of a lower center of gravity and reducing body roll. 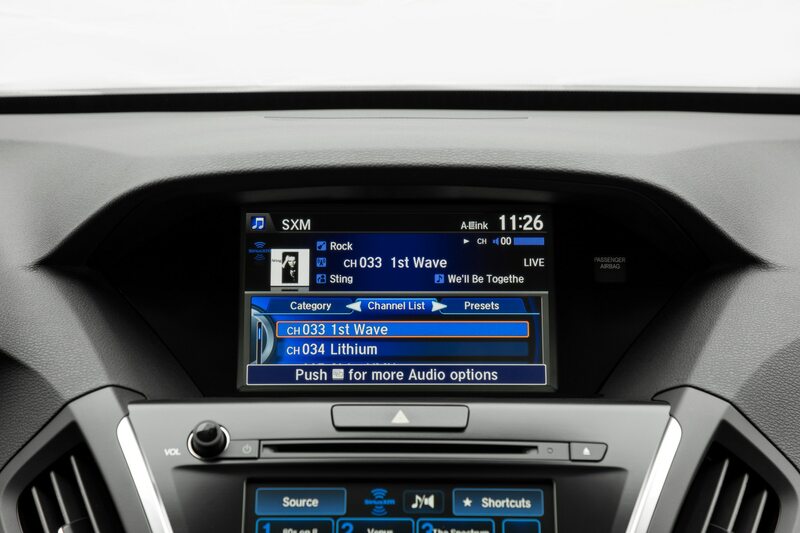 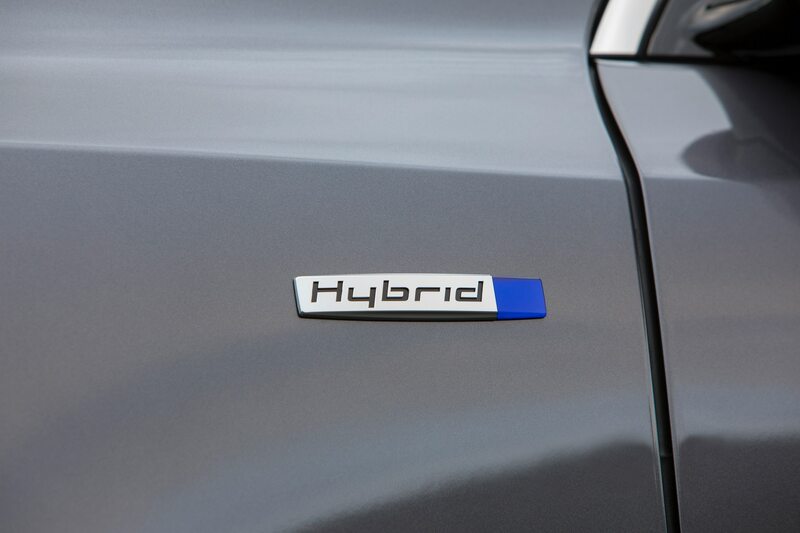 This gives the hybrid a more car-like driving experience. 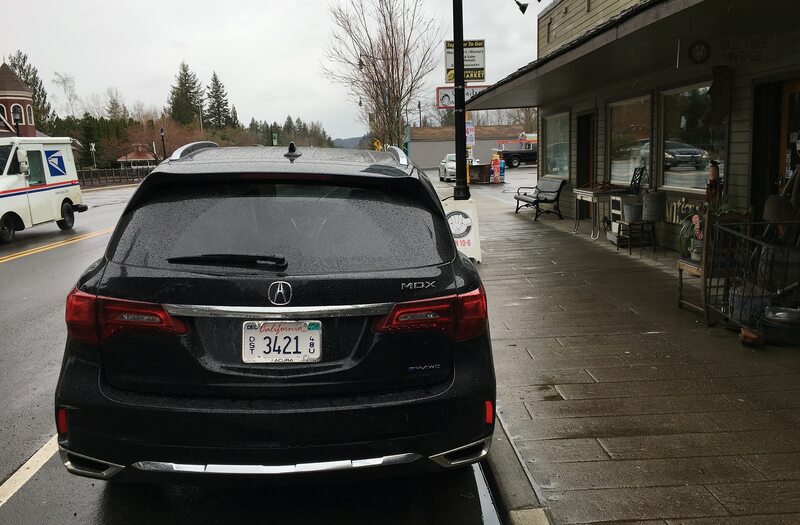 This is especially noticeable as we drove the SUV outside of the city along Washington’s picturesque farm roads surrounded by the snow-capped Tiger Mountains. 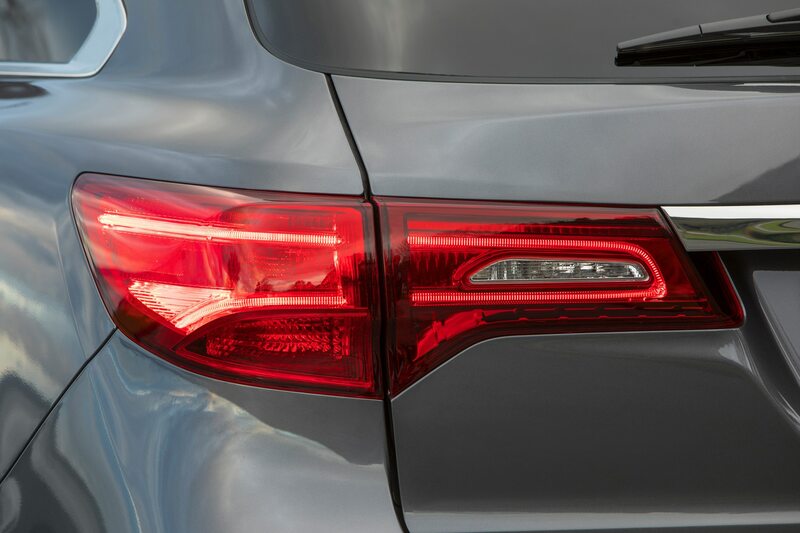 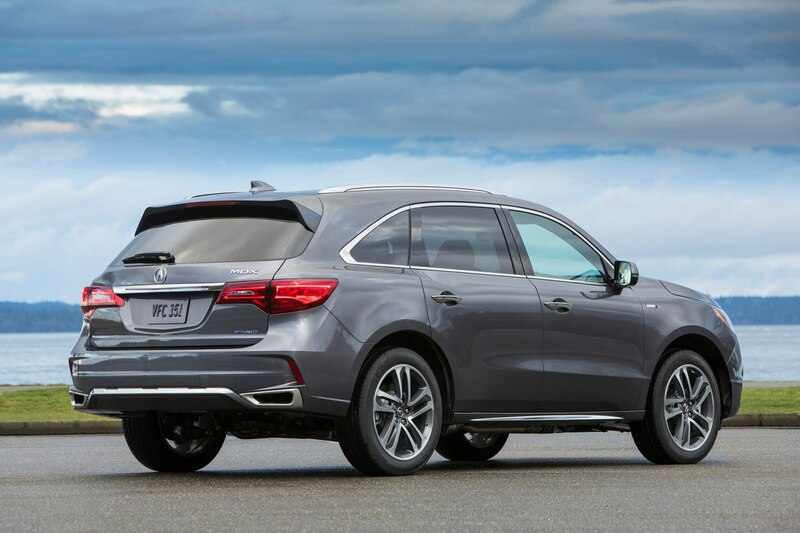 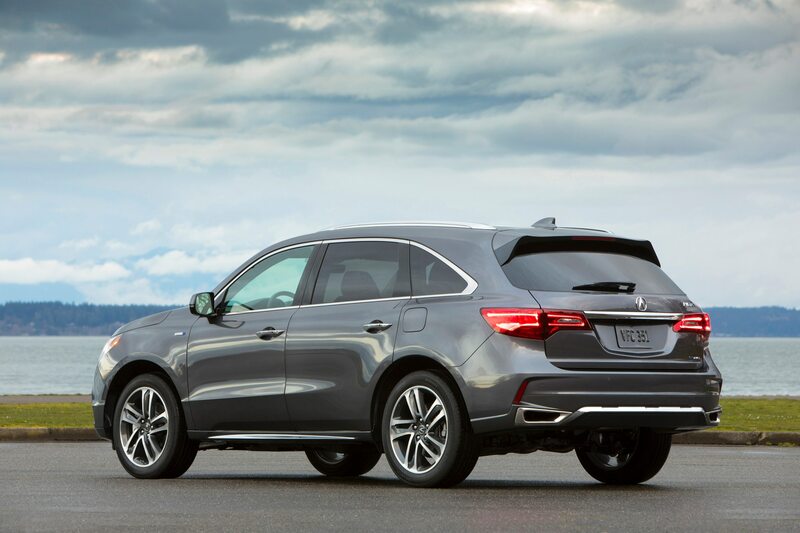 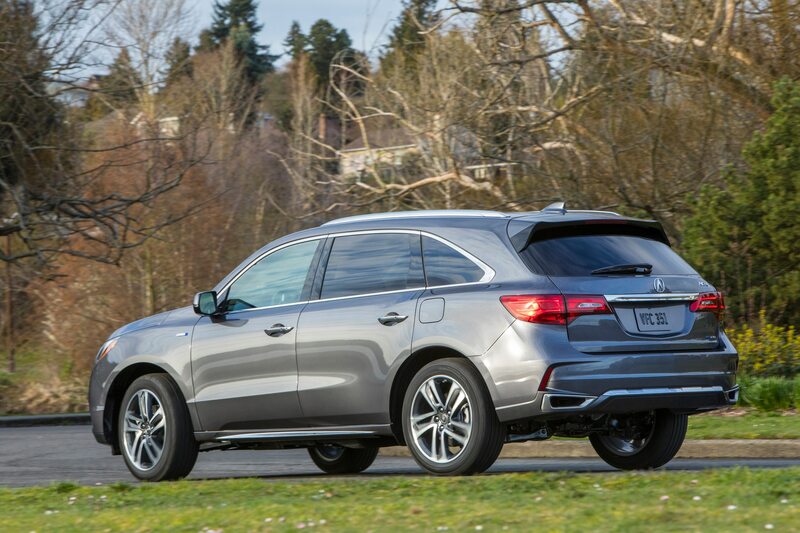 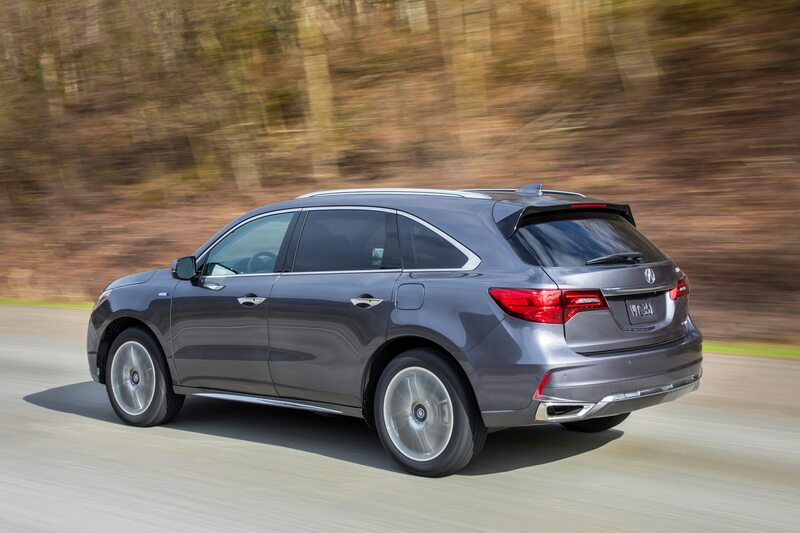 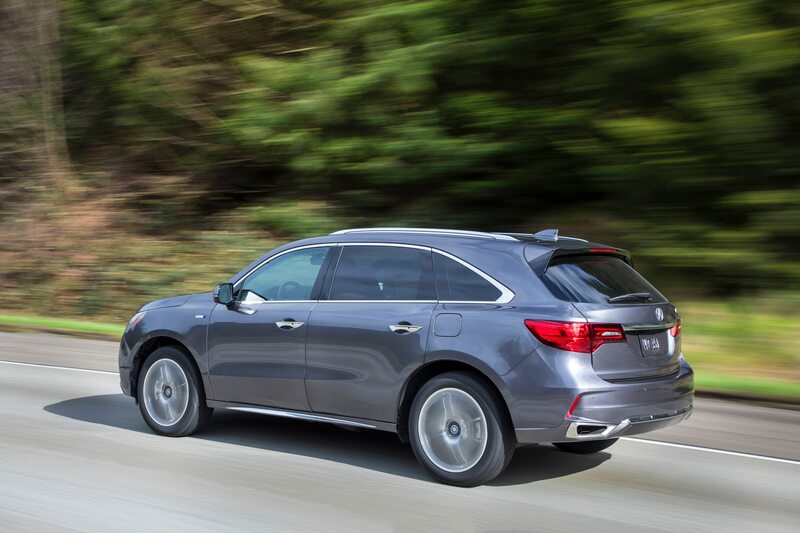 Handling is further improved by the MDX hybrid’s active front and rear dampers, and torque vectoring capability. 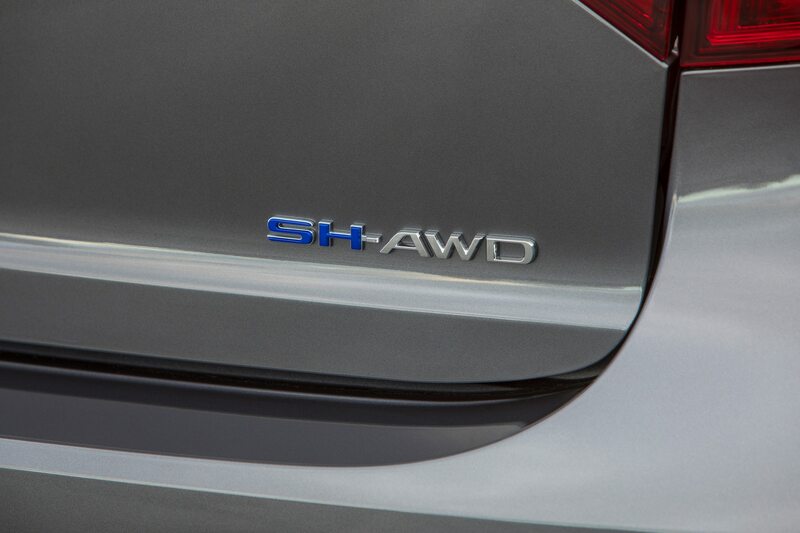 The SH-AWD system sends torque left and right to create a yaw moment that allows power to shift to any wheel. 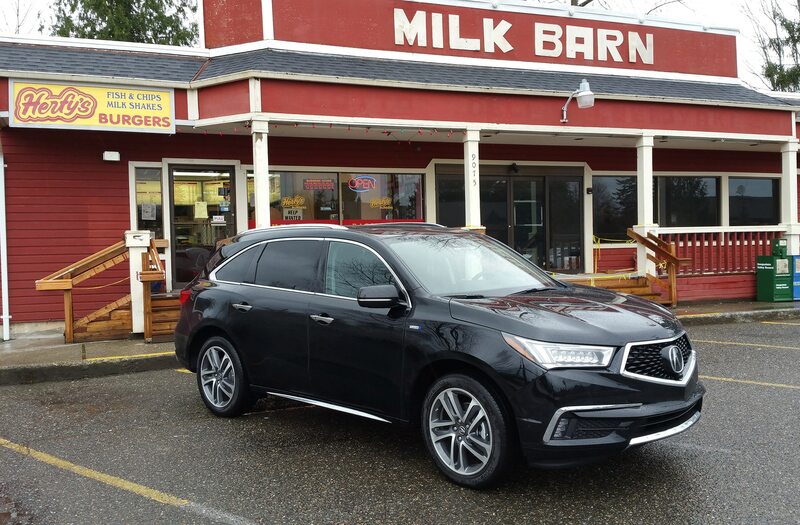 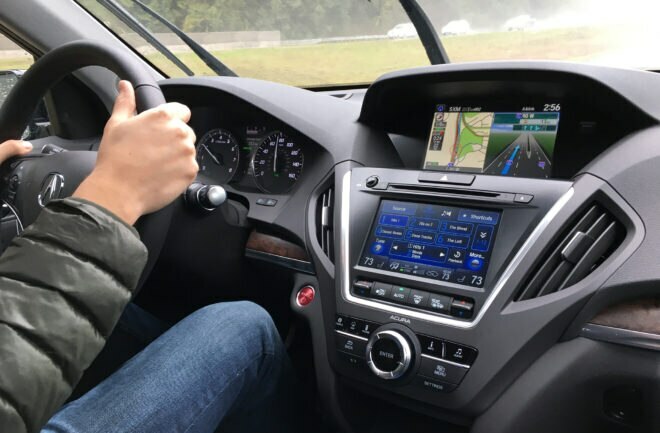 It’s hardly noticeable as you drive around town, but out on the highway it helps reduces understeer and is especially noticeable in the twisty turns of the slick roads we encountered along Washington’s Snoqualmie River. 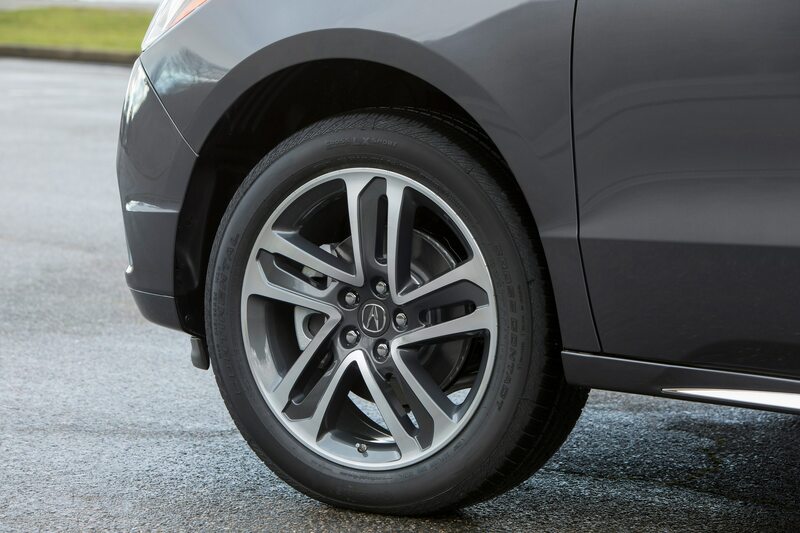 Depending on the turn, it can feel like a gentle push and pull from front to the back wheels or wheel nearest to the inside of the turn. Styling follows the most recent design direction that was inspired by the sporty Precision concept we saw last fall at the 2016 Los Angeles auto show. 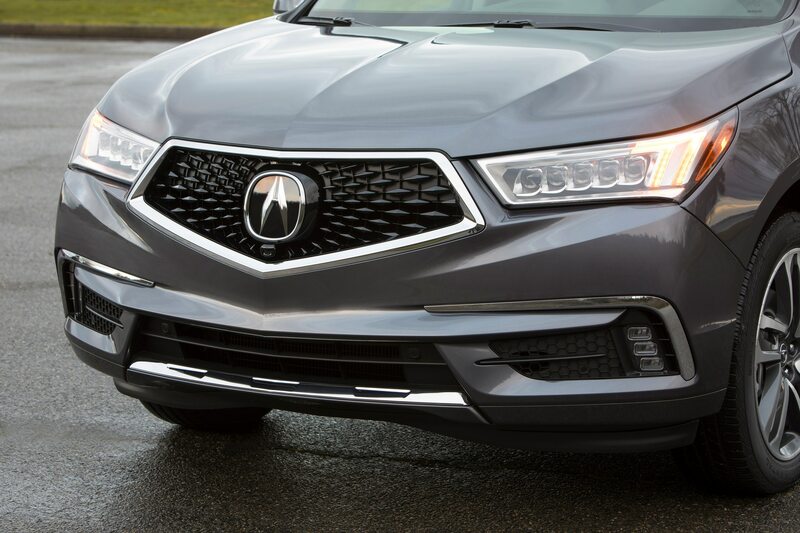 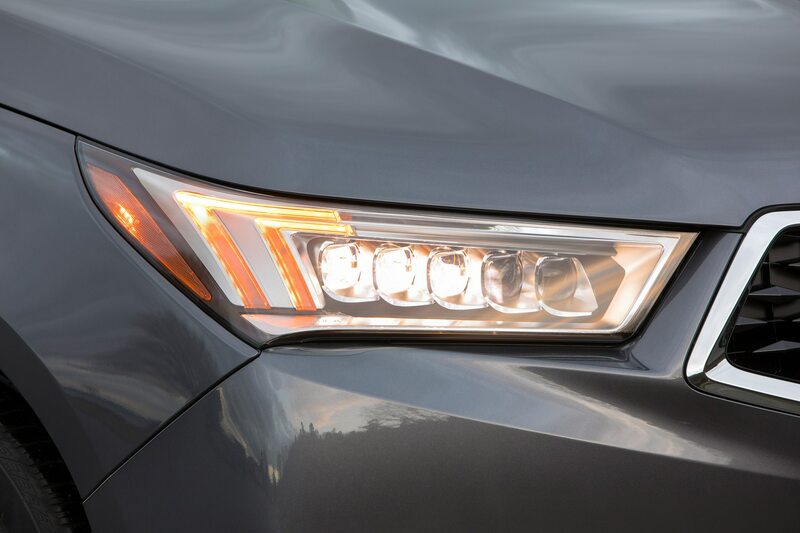 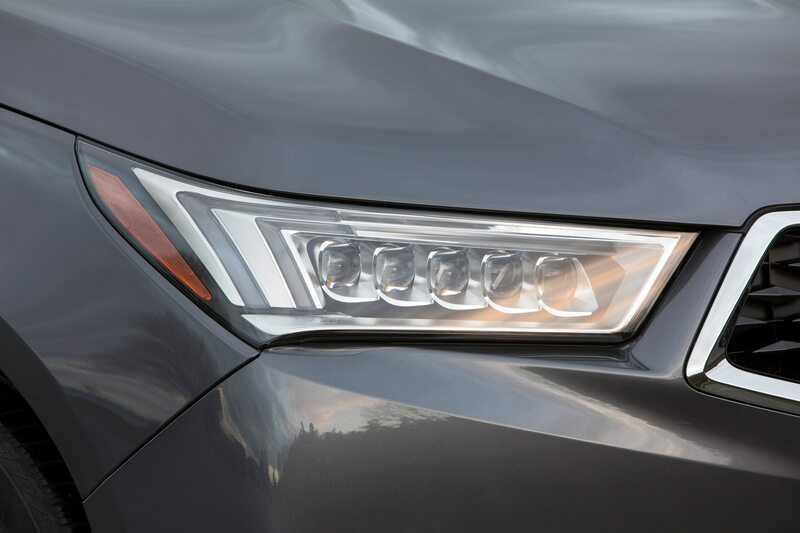 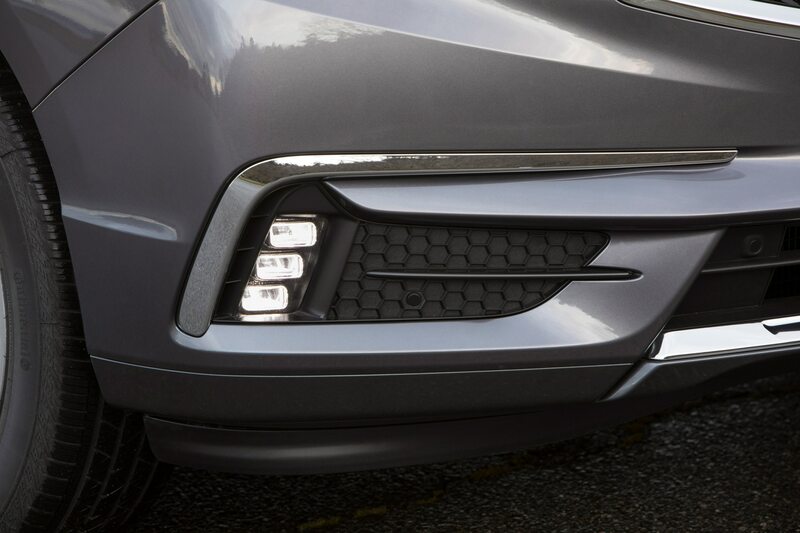 It sports the new diamond pentagon grille that we’re expecting to see on the refreshed 2018 TLX sedan. 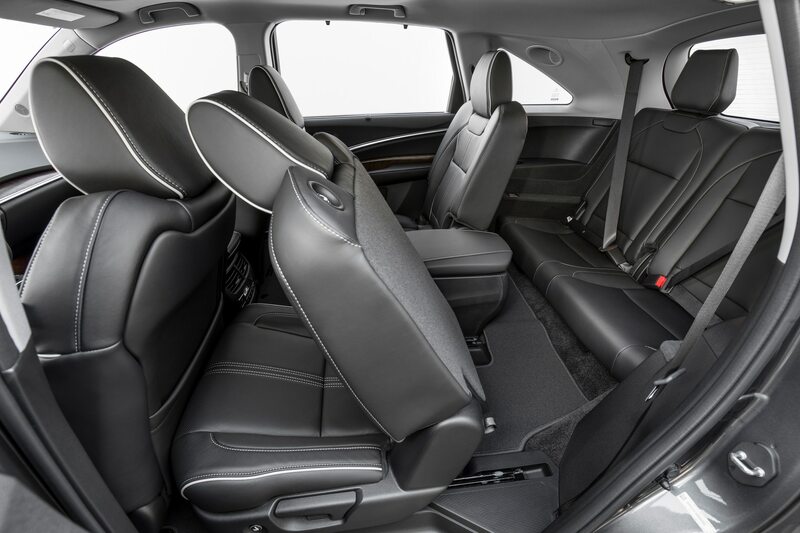 Up front, there’s plenty of legroom for the driver and front passenger to stretch out in. 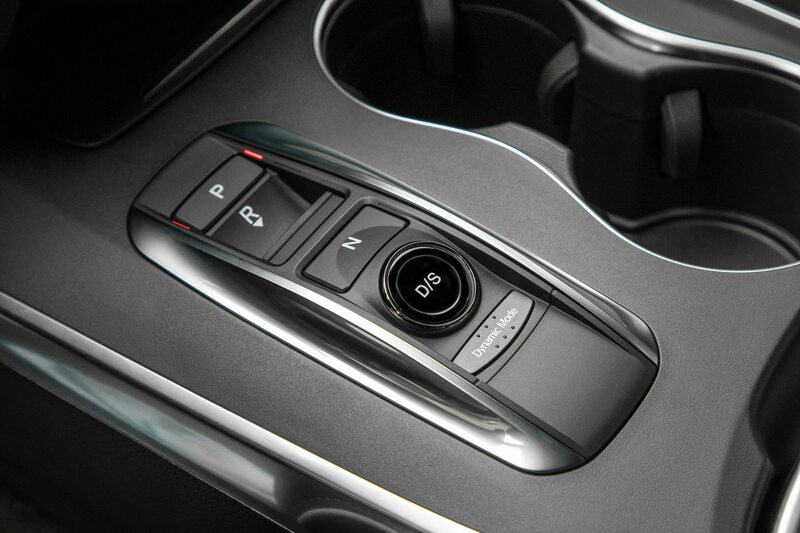 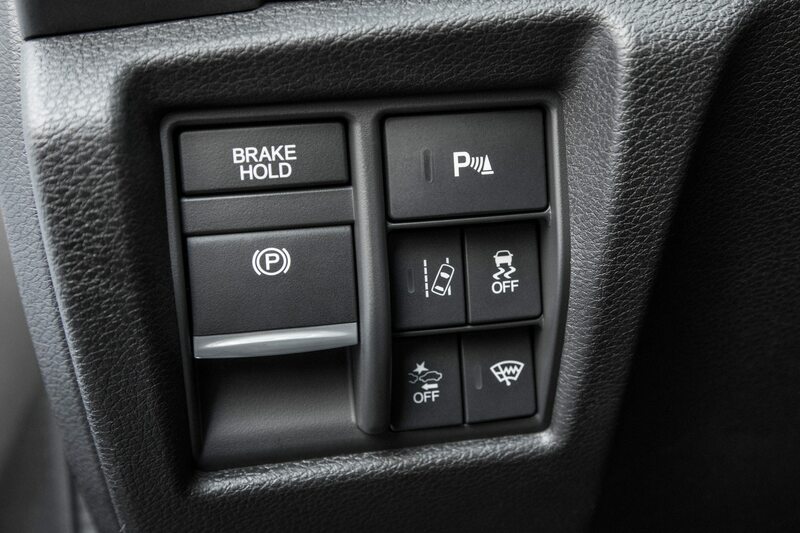 The elegant dash is angled toward the driver and easy to read. The second row is nearly as good for space, and the third row is cozy enough for two 6-foot tall passengers to reside. 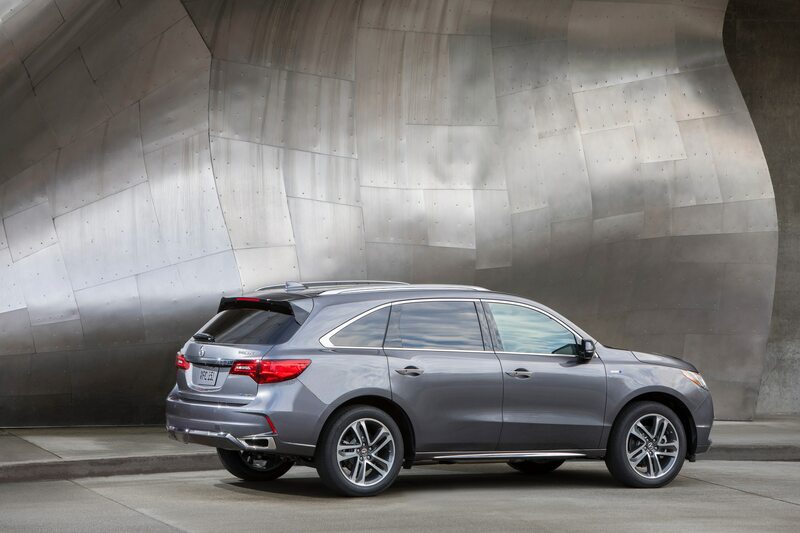 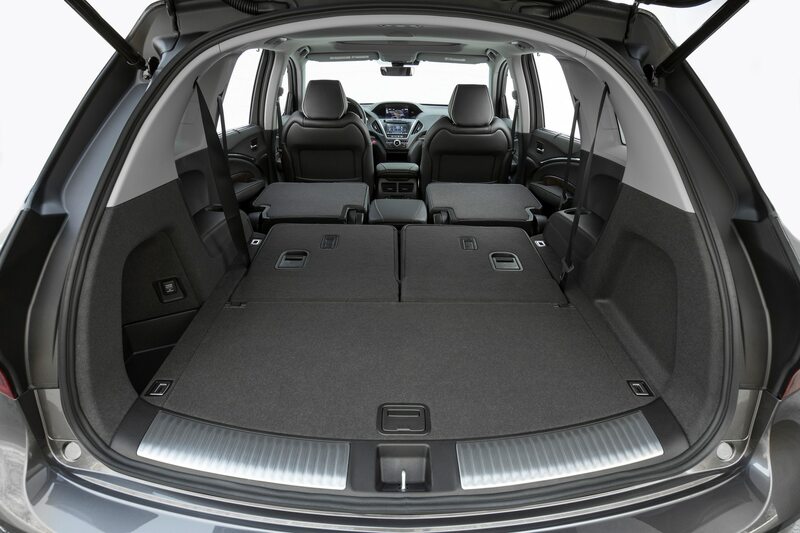 The MDX SH SH-AWD’s super quiet cabin can seat six or seven passengers, depending on the trim level chosen. 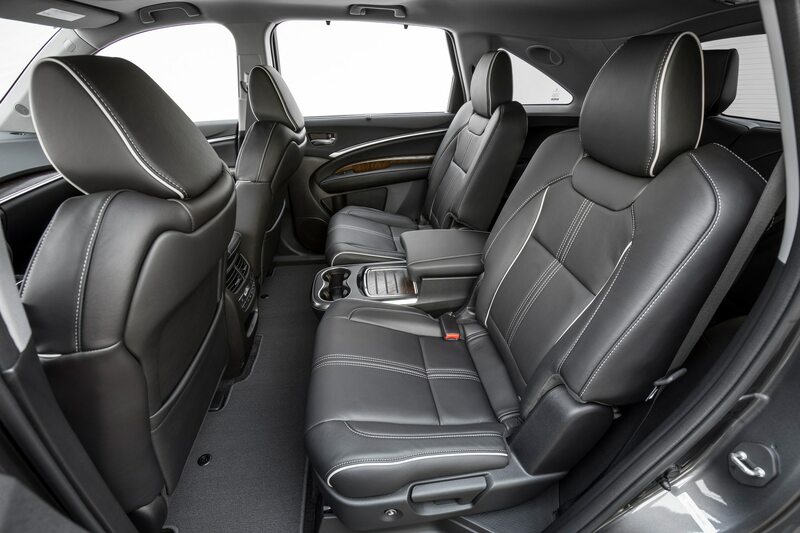 We tested the advance version with second row captain’s chairs that seats six versus the base model that can seat seven. 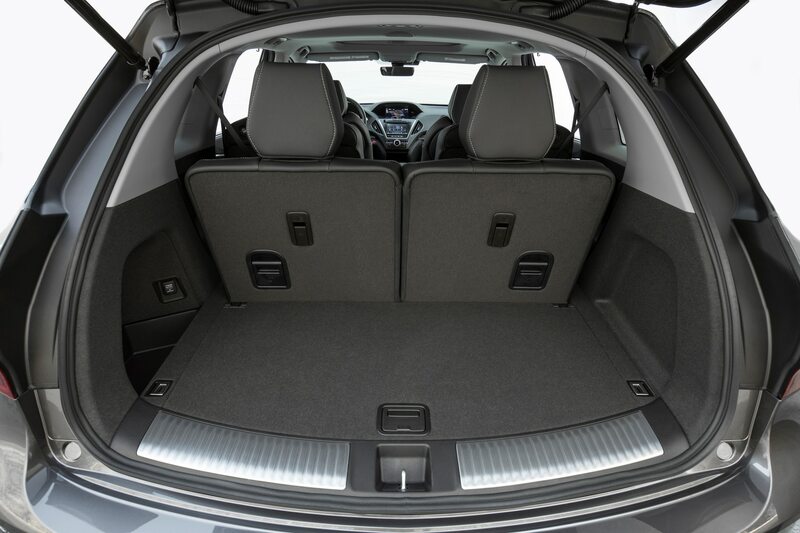 The latter offers more space between second row passengers and offers better rear window visibility for the driver. 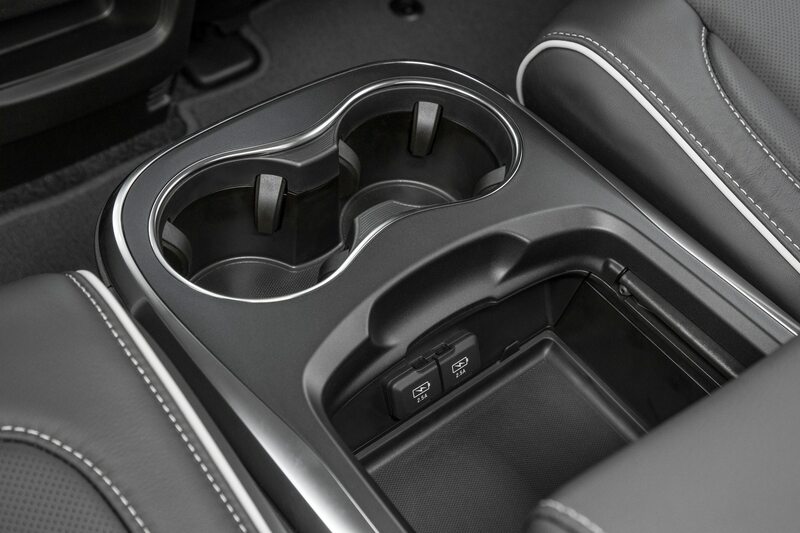 Inside, there’s a plenty of dark wood trim, cup holders, and USB chargers for the whole family. 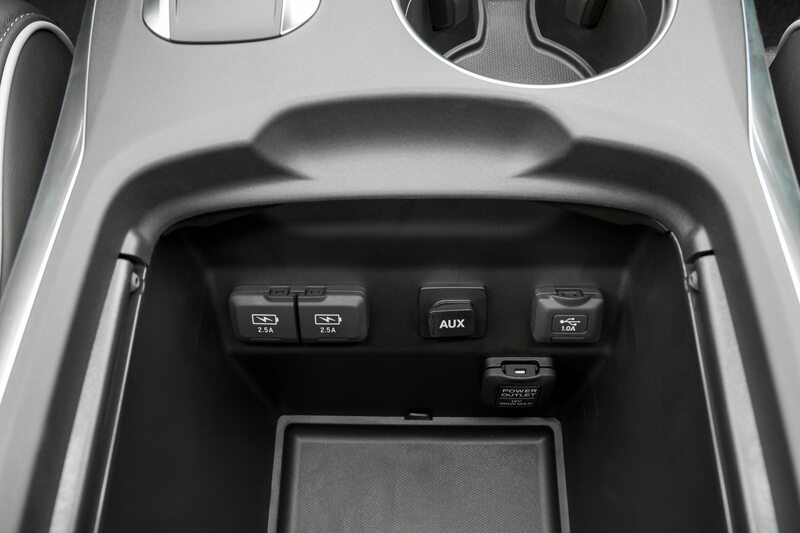 We counted two power ports, an auxiliary charger, and a USB port up front, plus two more for the second row, and another two for the third row. 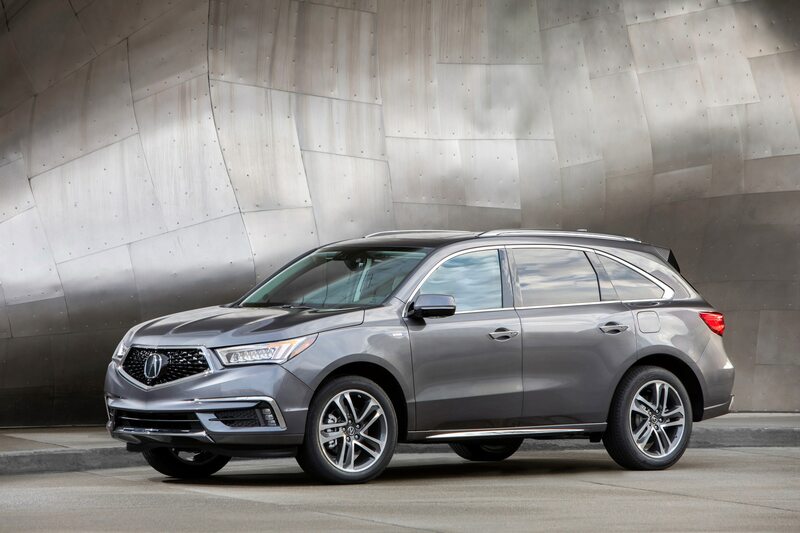 A base MDX Sport Hybrid with the technology package starts at $52,935 and the advance version we drove starts at $58,975. 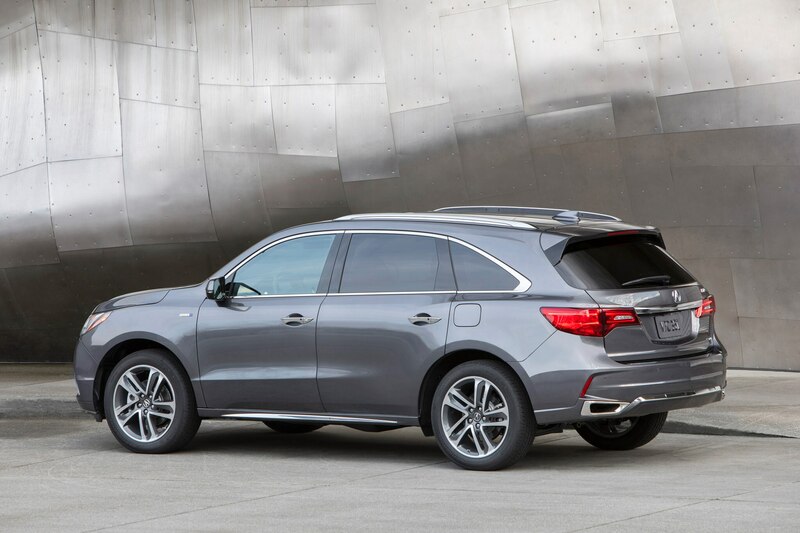 It’s priced slightly below its main competitors — the Infiniti QX60 hybrid, Lexus RX450h, and BMW X5 xDrive 40e. 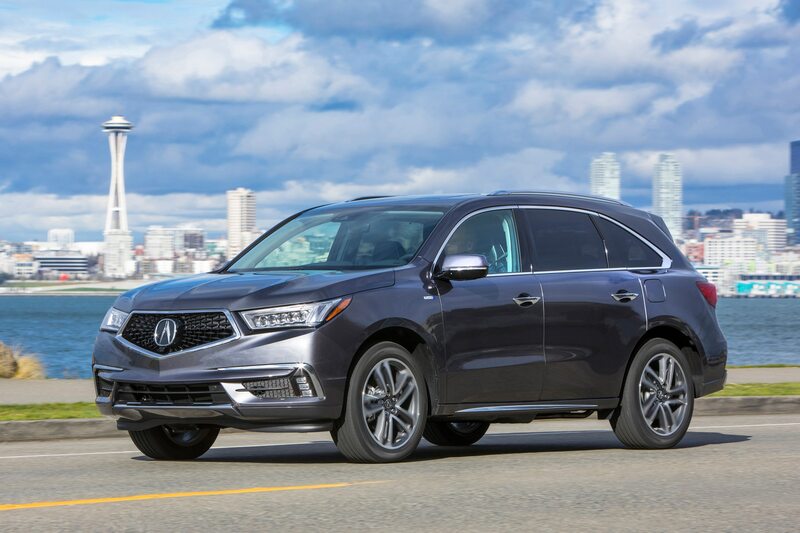 Having the opportunity to test the QX-60 hybrid and Lexus RX450h the same day, the MDX SH seemed to offer a peppier ride and more torque feel during our initial driving impressions. 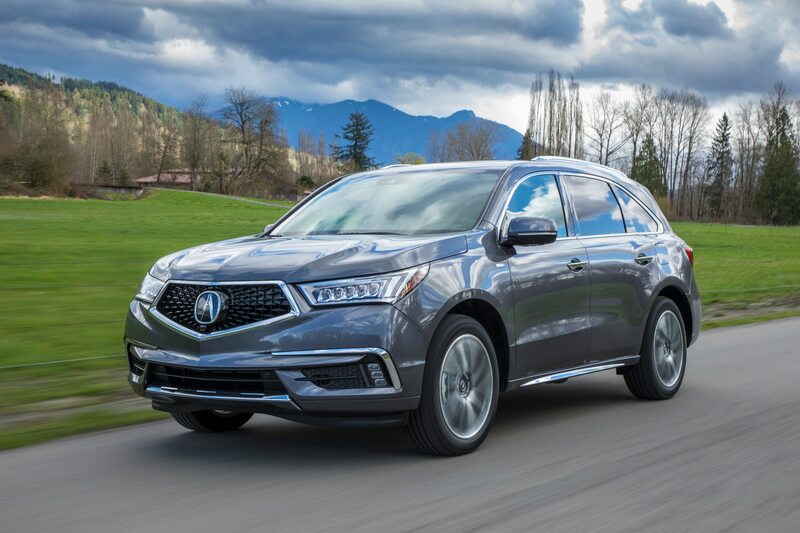 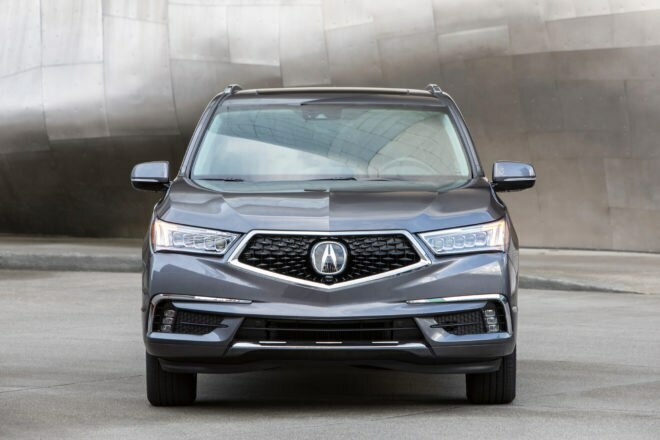 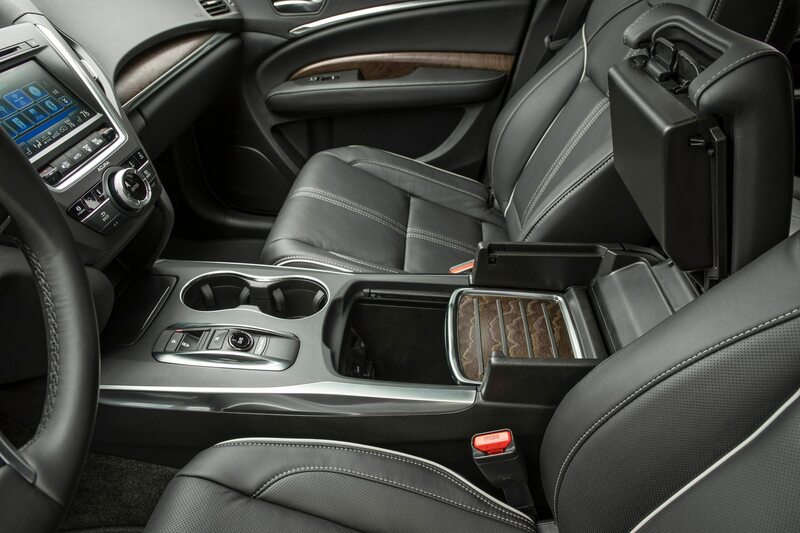 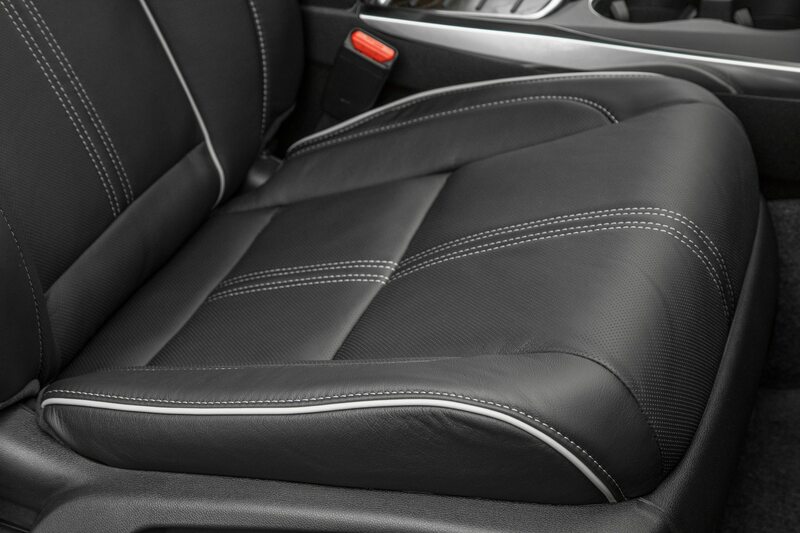 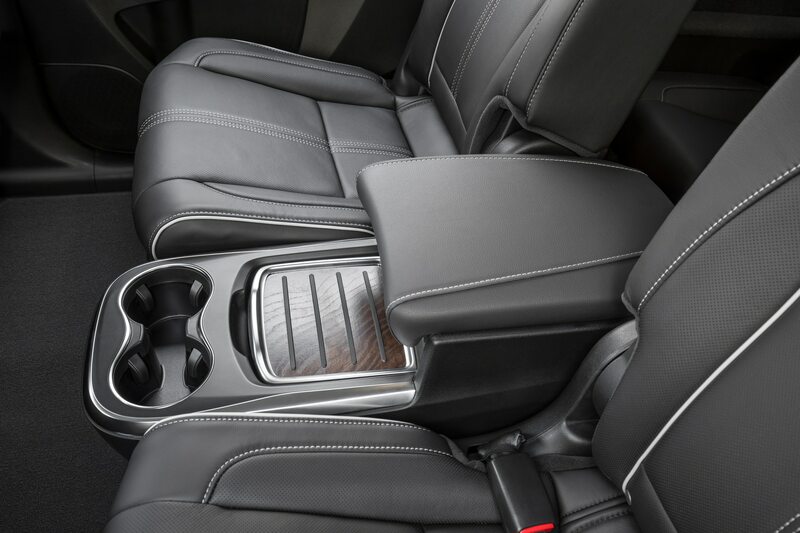 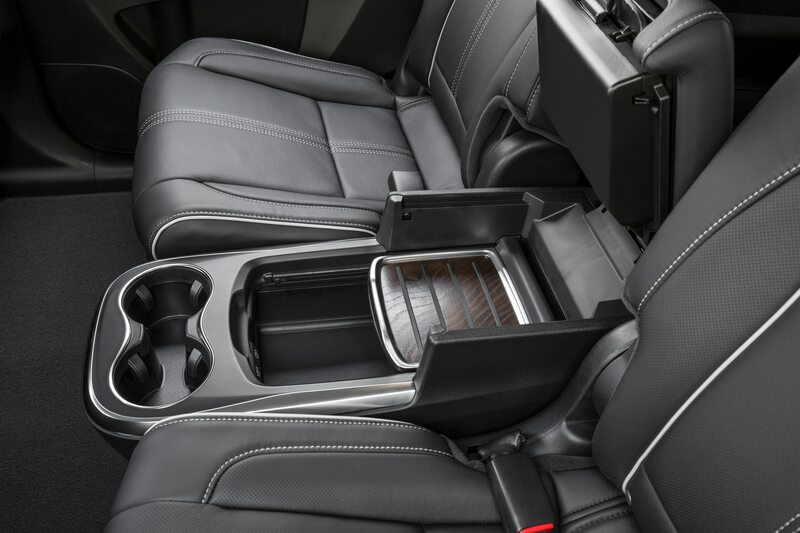 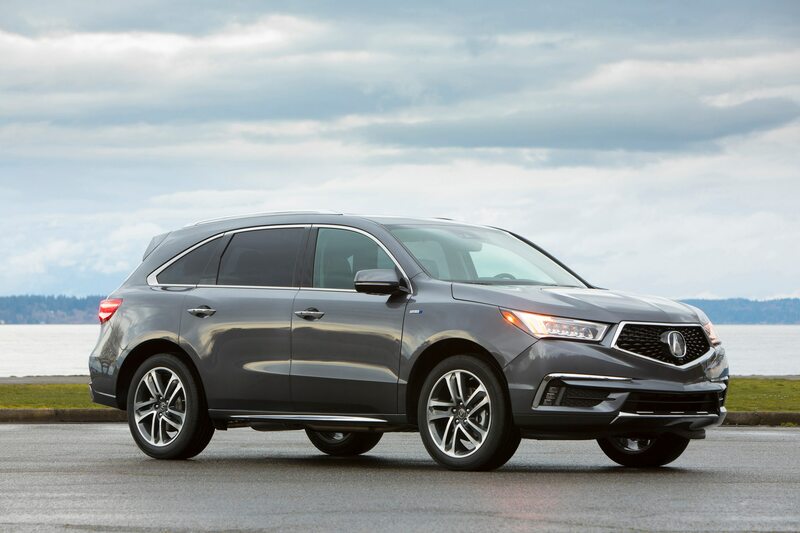 Acura’s advance package gets all of the above while seating only six passengers because of the second row, heated captain chairs with a center console. 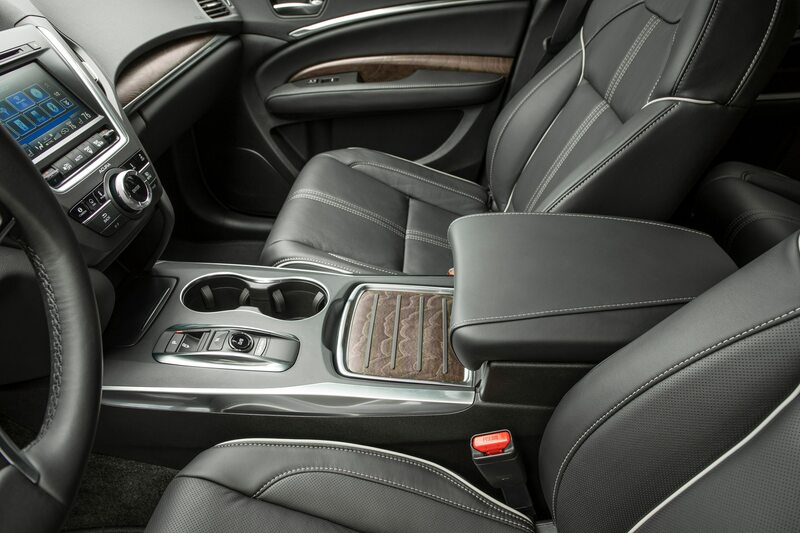 It also gets fancier leather options, open-pore wood accents, front seats with heat and ventilation, surround view camera, sunshades, LED fog lights, and welcome lights. 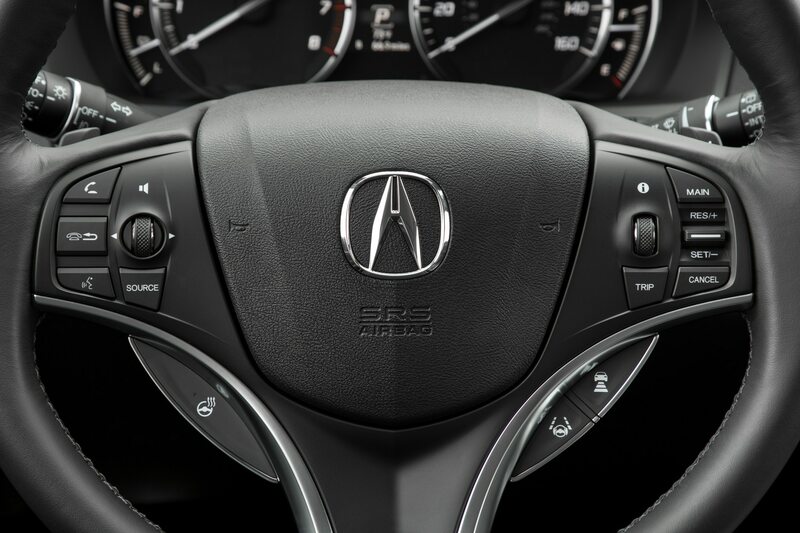 The heated seats and steering wheel are a must for colder climates and recommended highly — especially if you live in the Seattle area. 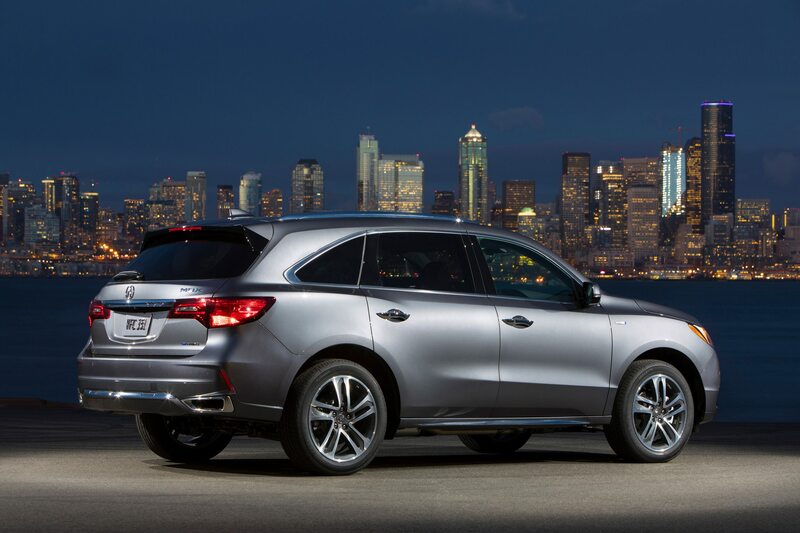 Acura’s MDX SH SH-AWD SUV is available in seven flavors with four interior options. 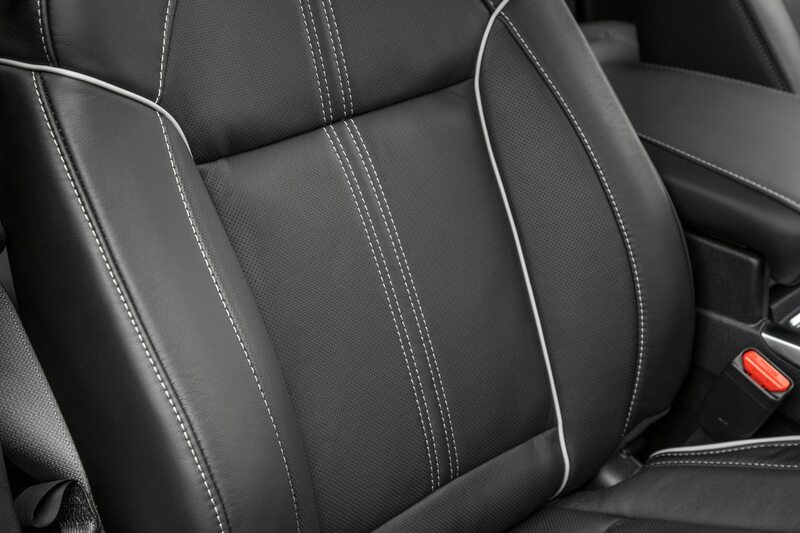 We tested a Crystal Black Pearl model with an Ebony interior. 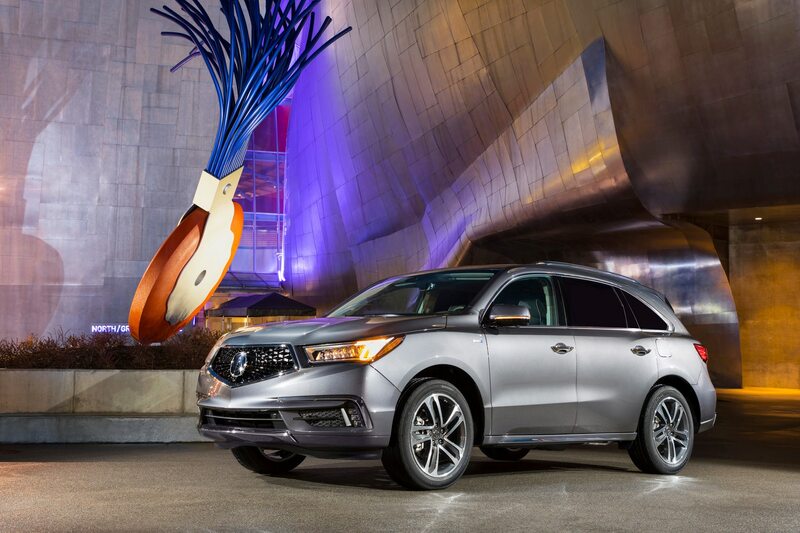 While we love to own a NSX as our daily driver, the MDX hybrid is a much more practical alternative for families.